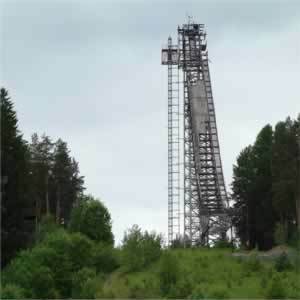 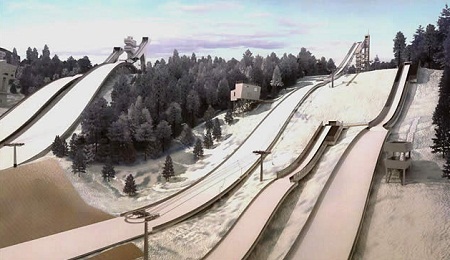 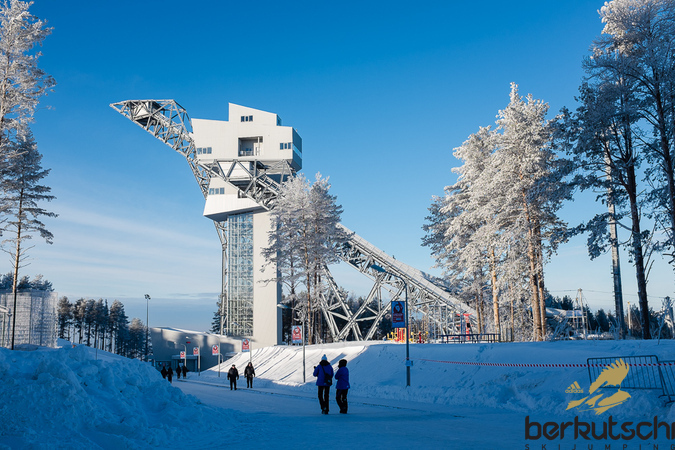 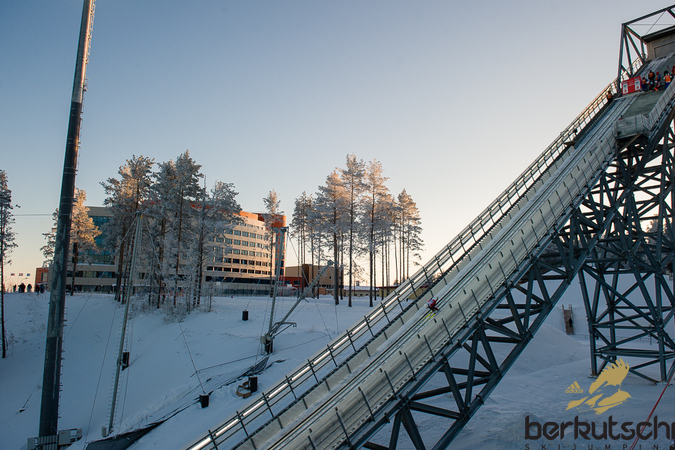 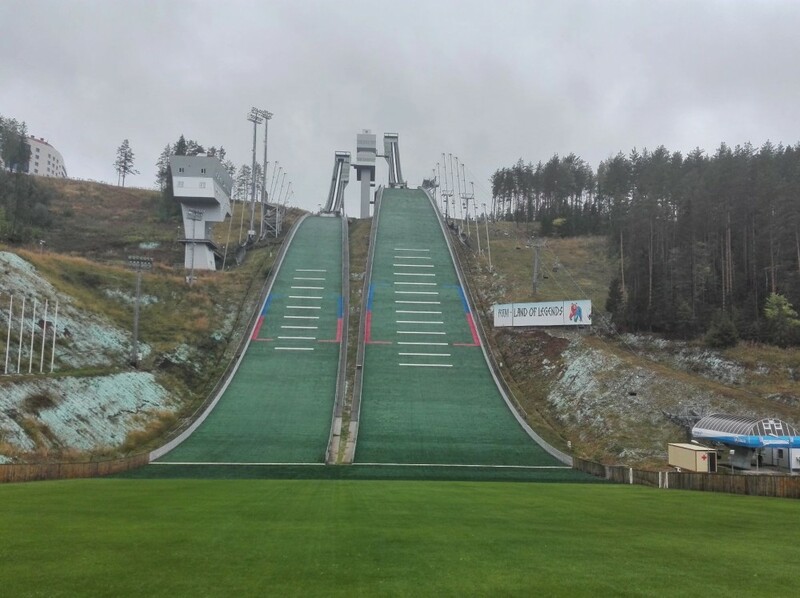 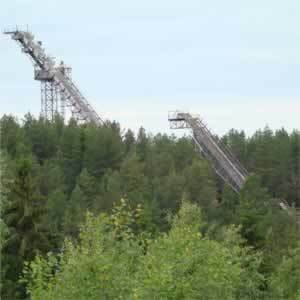 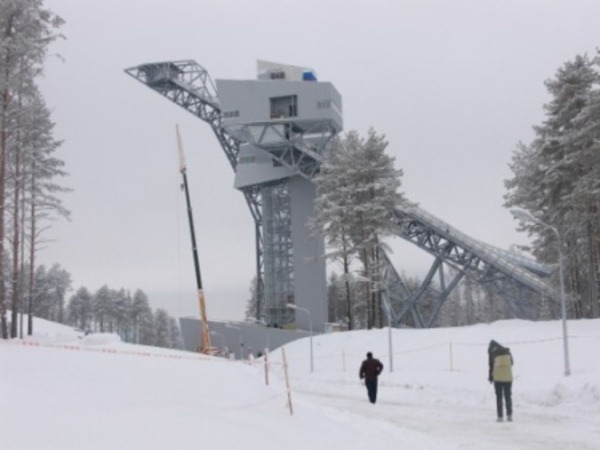 The ski jumping facility “Snezhinka” (en: snowflake) at Chaykovsky near Perm is affiliated to the national winter sports training centre "A. 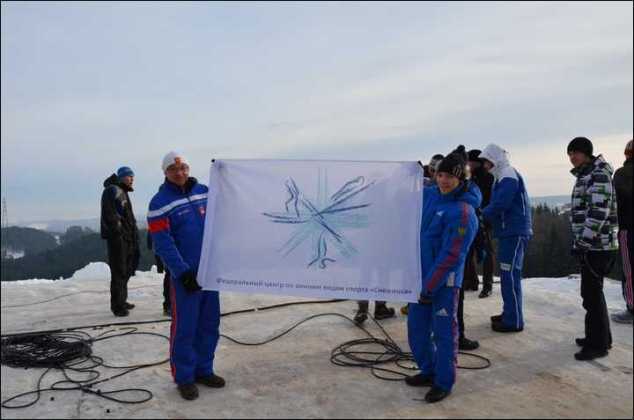 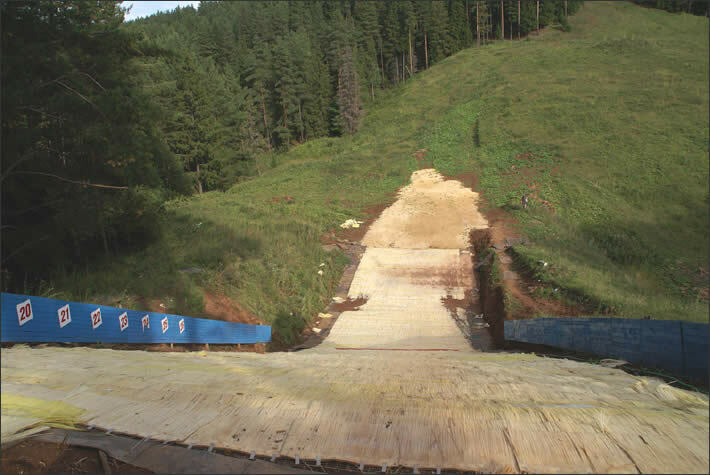 A. Danilova", a winter sports school at which 150 pupils are educated. 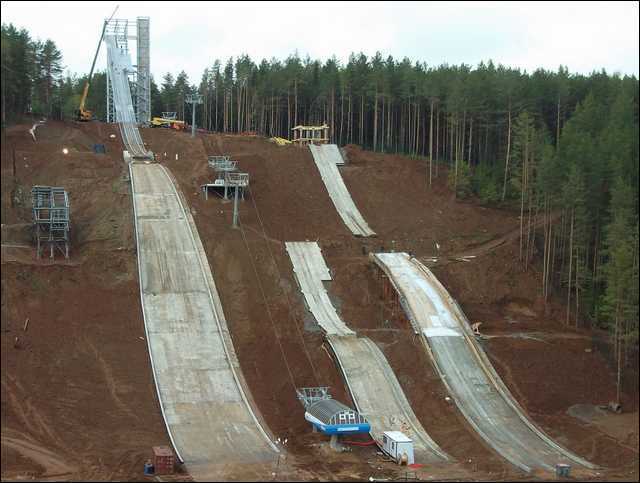 In 1980, the first 40 meter ski jumping hill was constructed and then the jumping centre was expanded to K90, K60, K40, K20 and K10 until 1985. 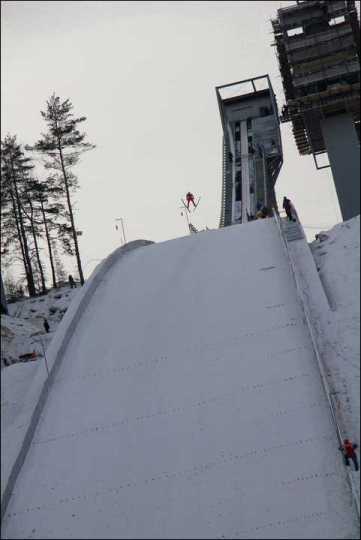 Competitons of the 8th and 9th Winter-Spartakiads were hosted there in 1985 and 1989, respectively, and the national championships of USSR in 1989 and 1994. 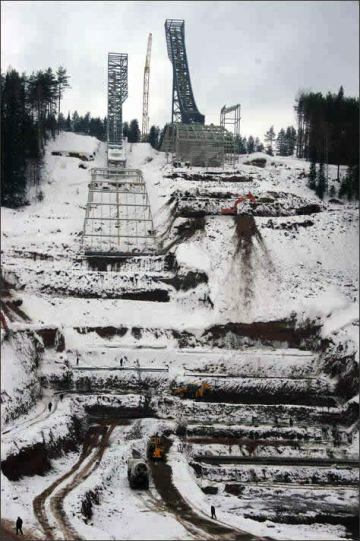 However, after that the hills were not used anymore and dilapidated. 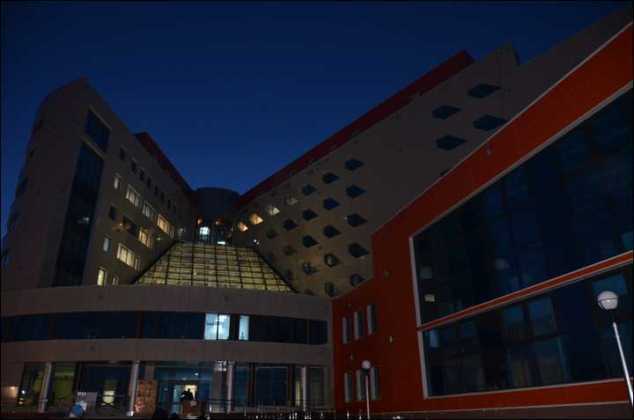 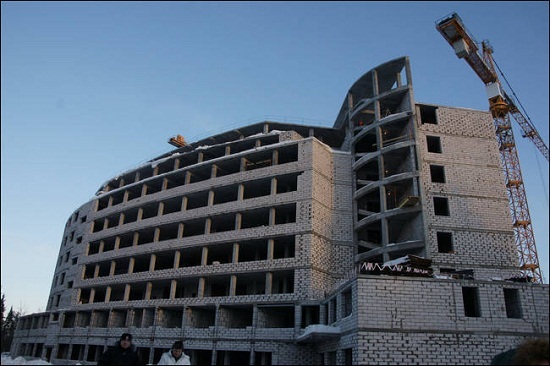 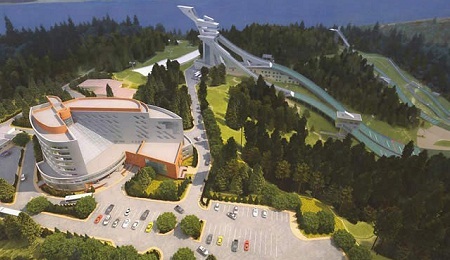 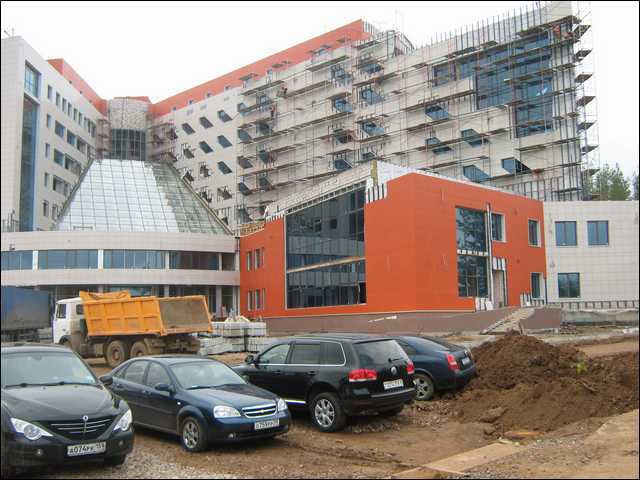 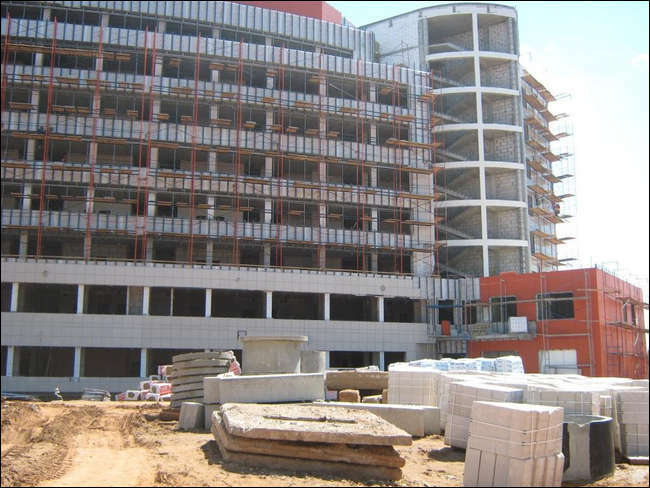 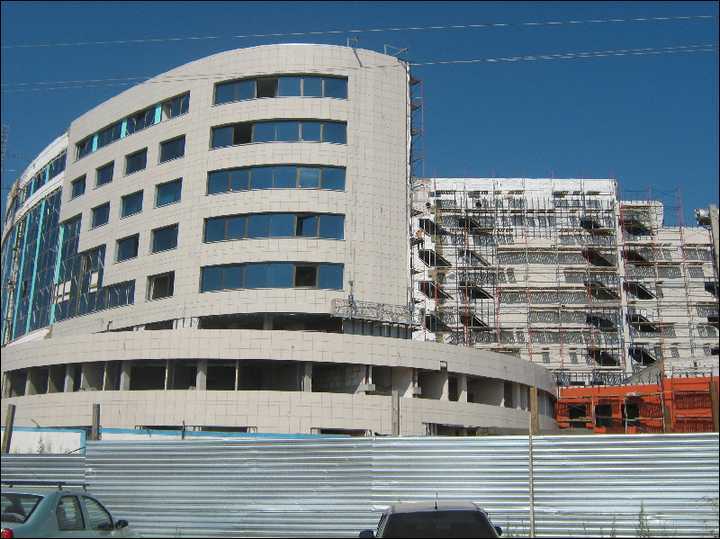 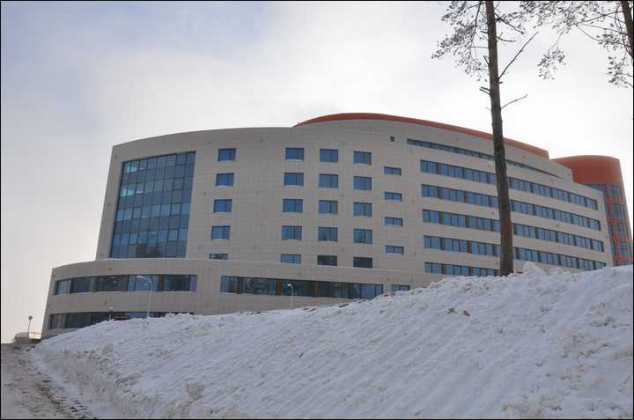 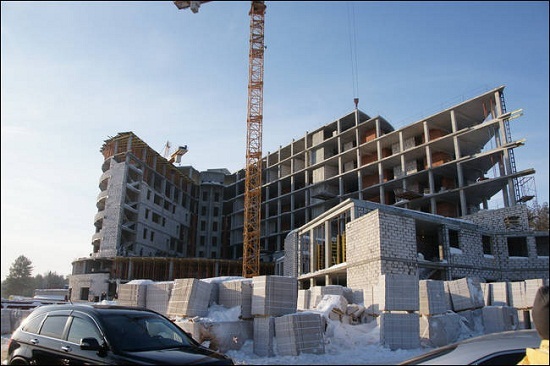 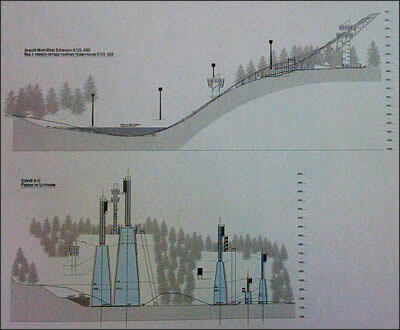 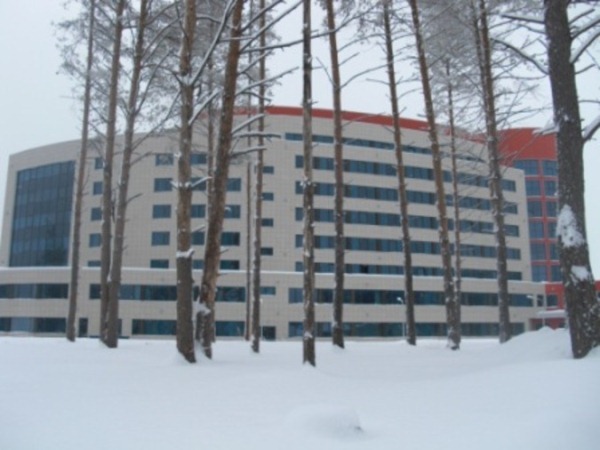 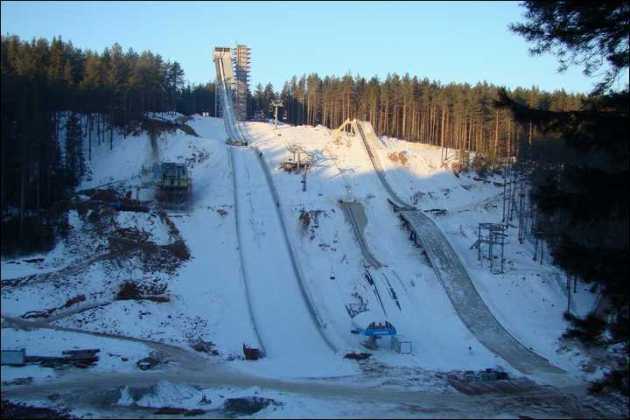 In late 2000's plans for the construction of five new jumps at Chaykovskiy were made, including a HS 140 and HS 106, as well as biathlon facilities and a hotel. 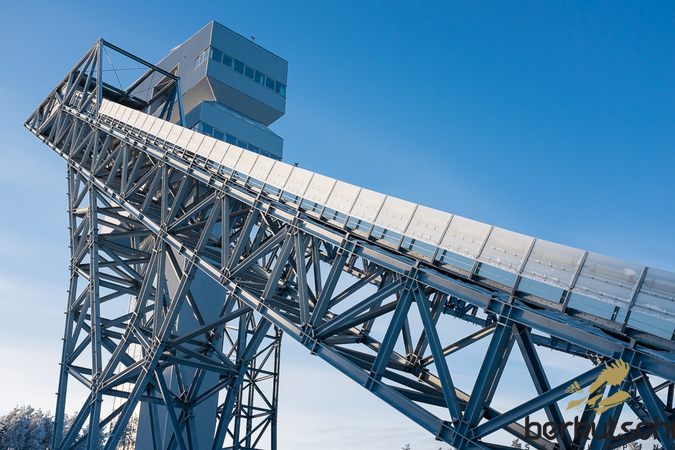 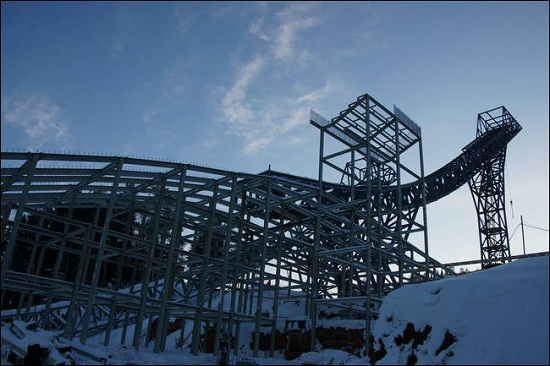 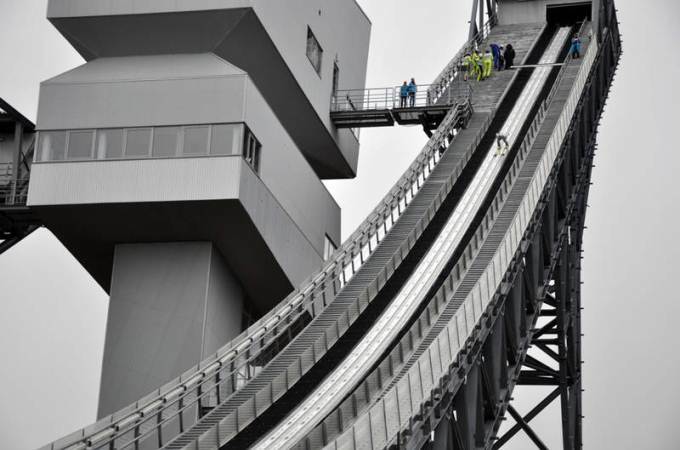 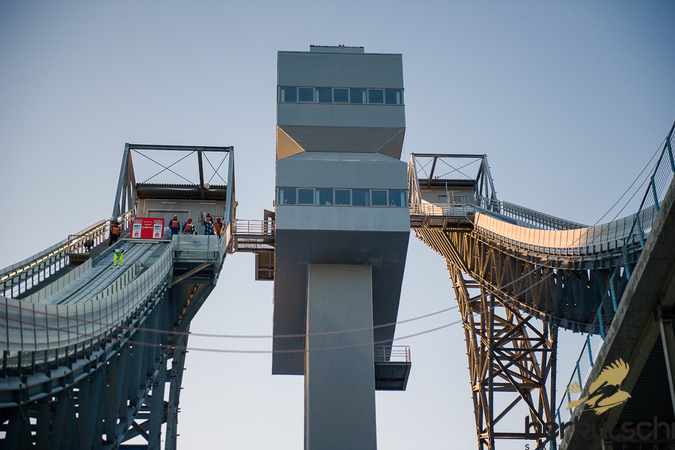 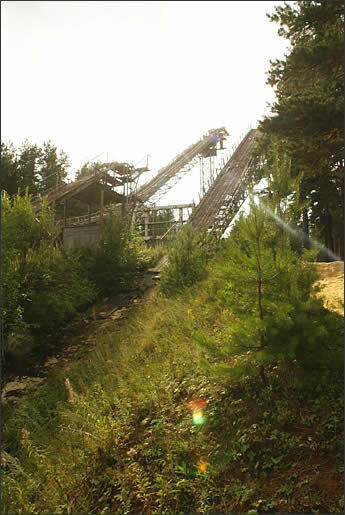 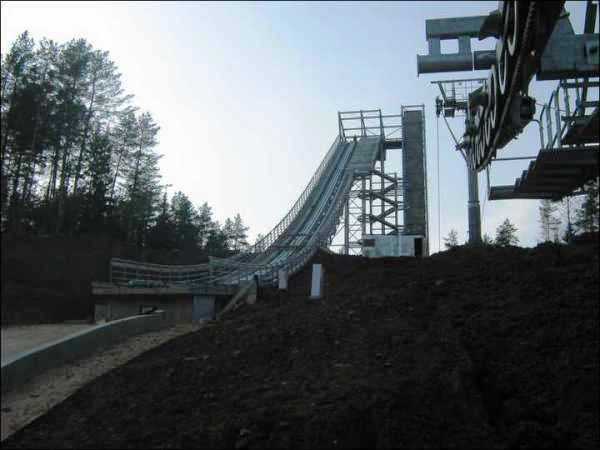 The investment with a total of around 110m Euro started in 2009, in 2010 the ski jump constructions followed and were planned by German Werner Schertel from Warmensteinach. 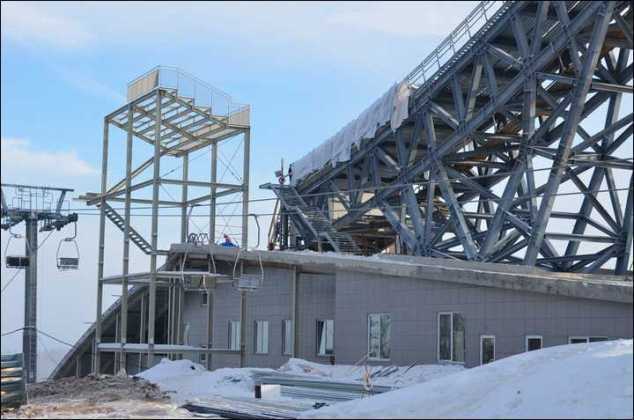 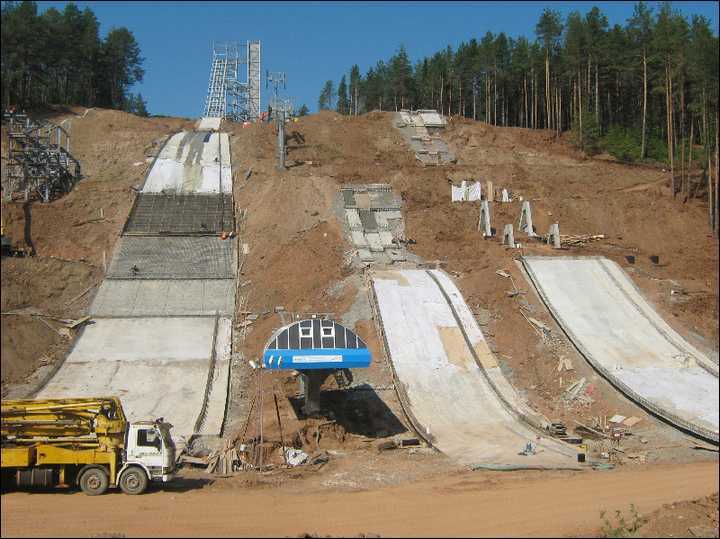 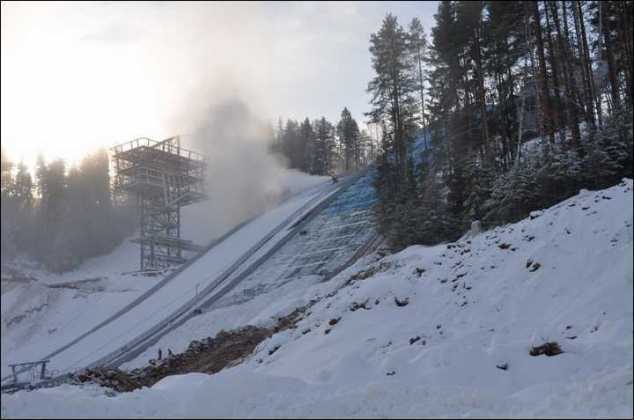 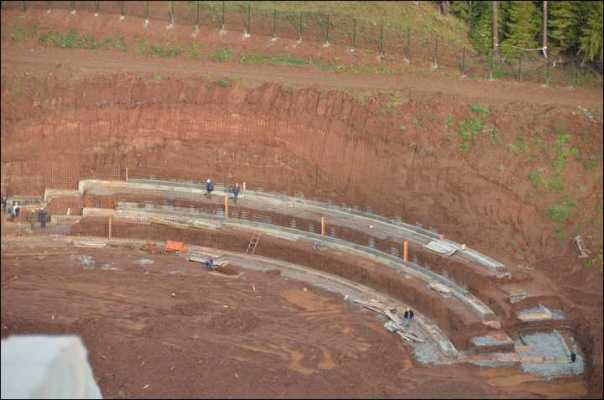 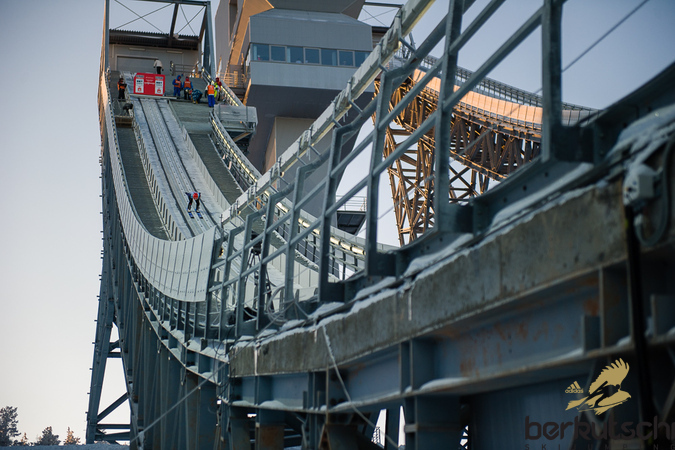 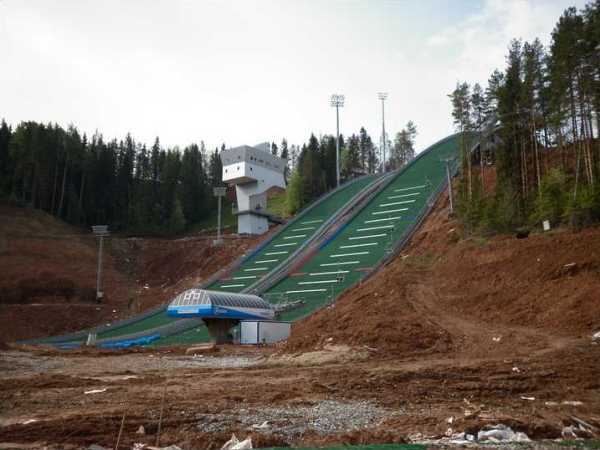 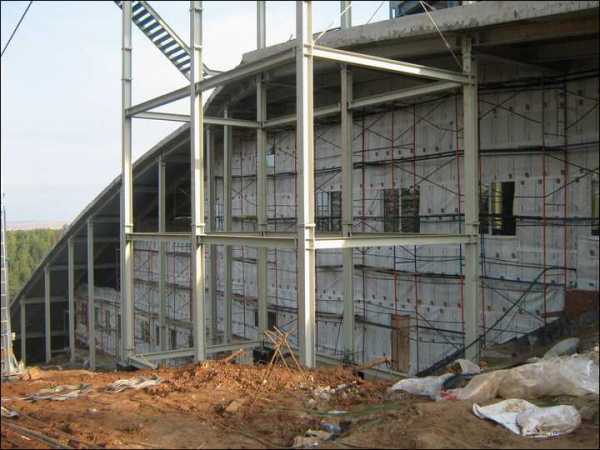 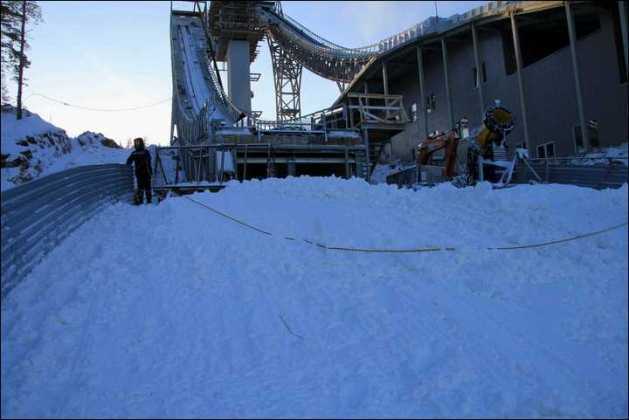 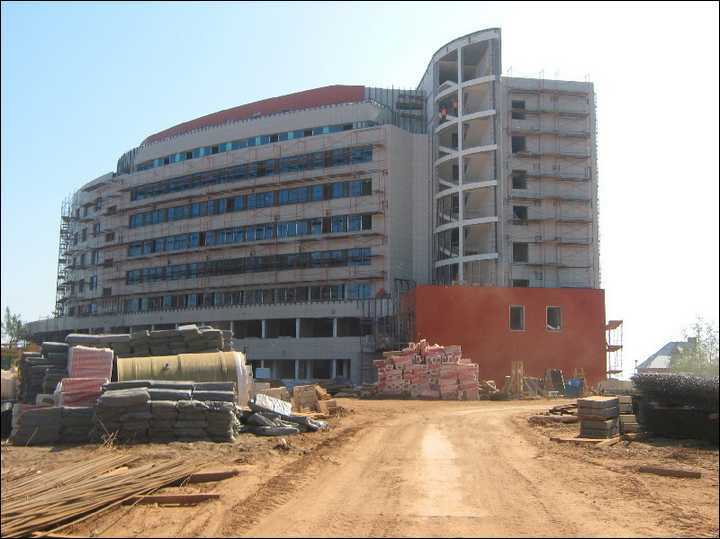 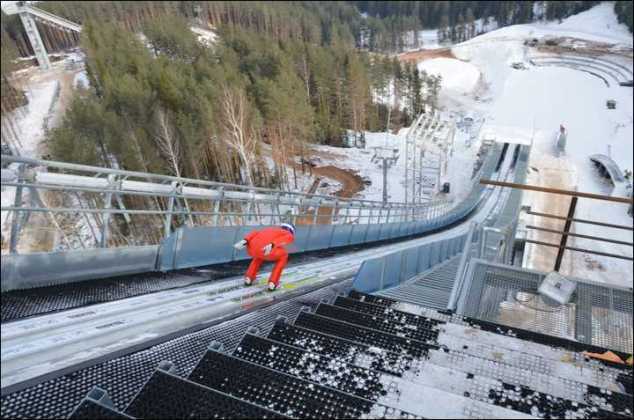 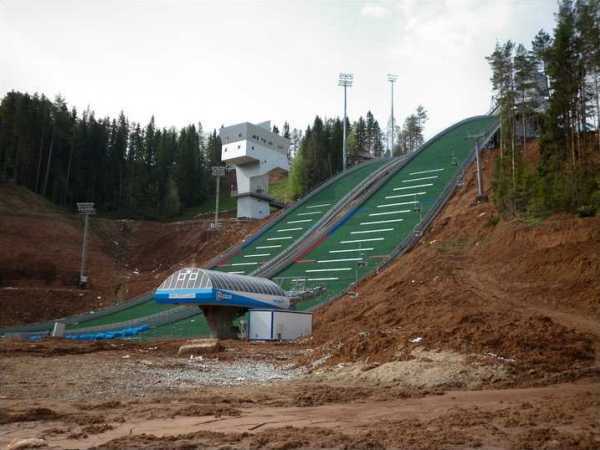 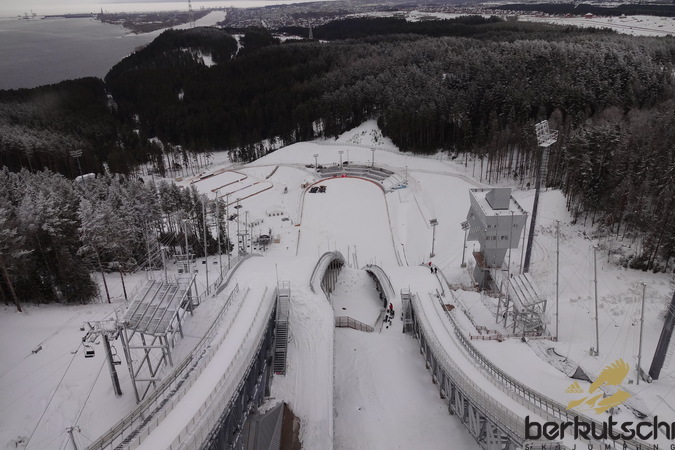 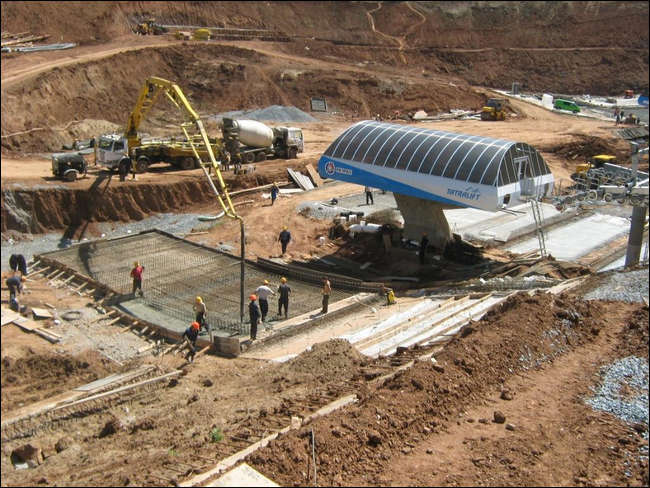 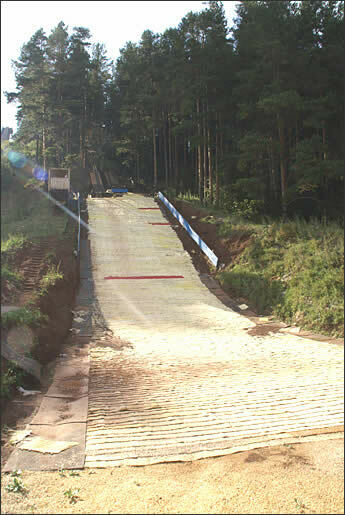 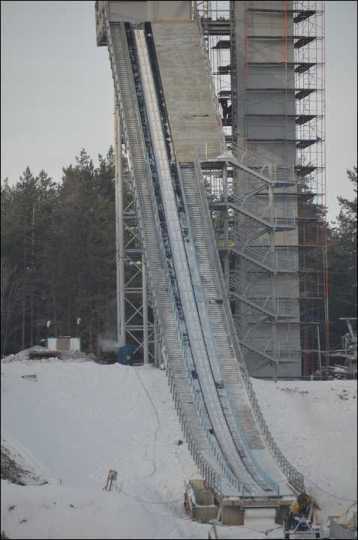 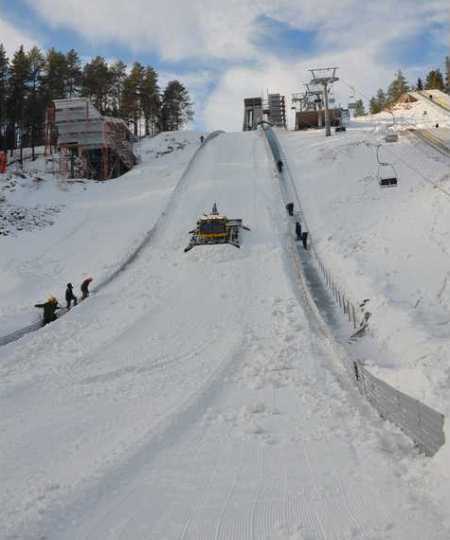 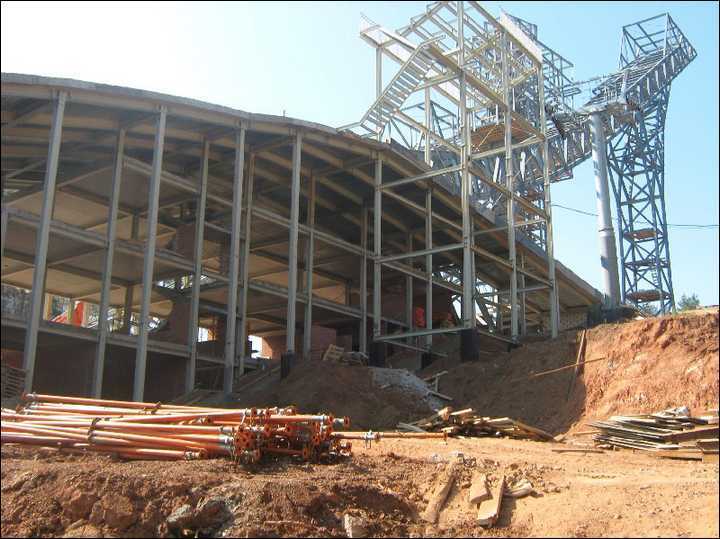 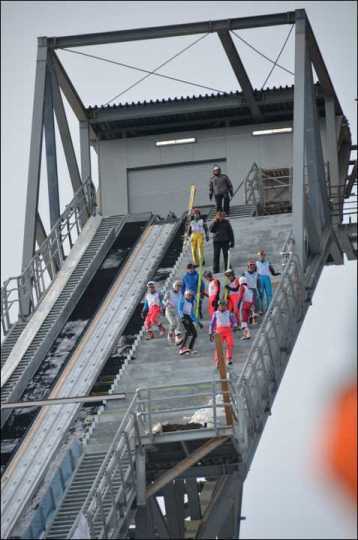 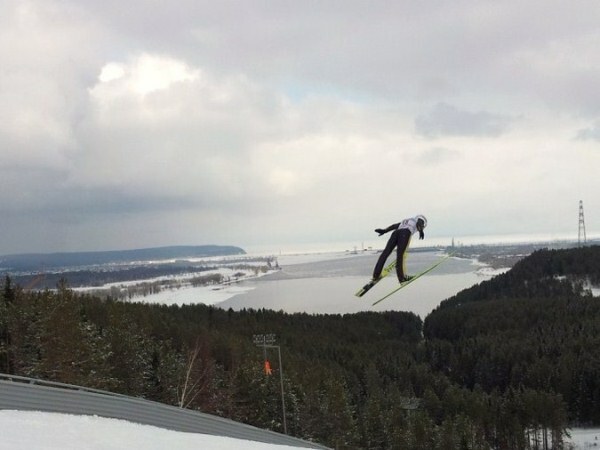 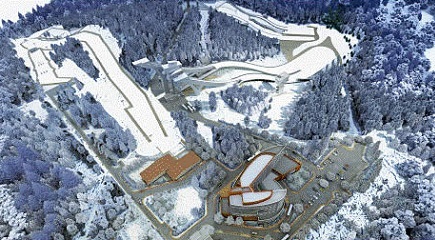 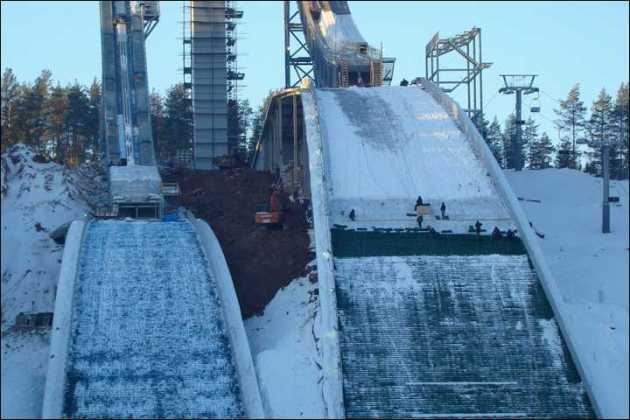 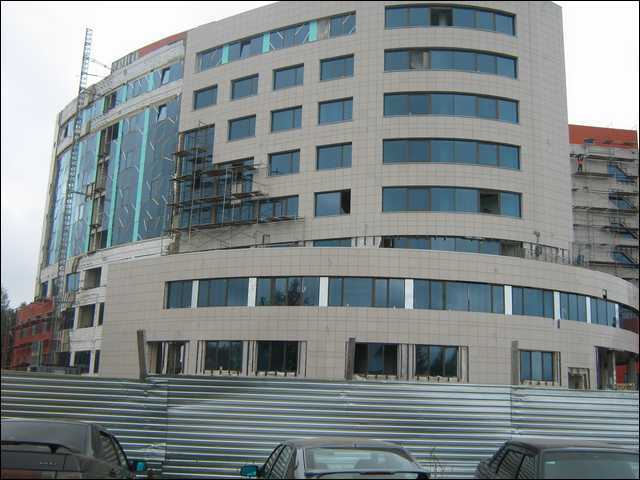 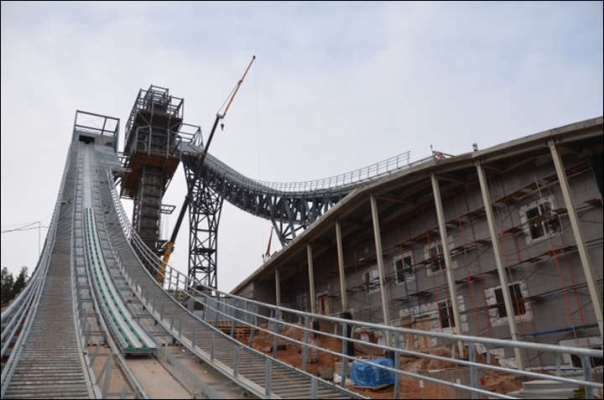 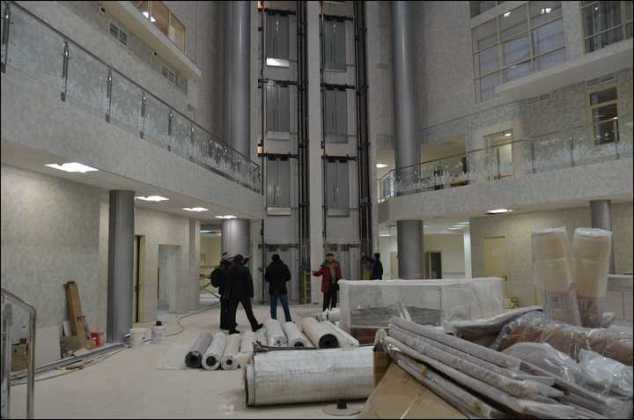 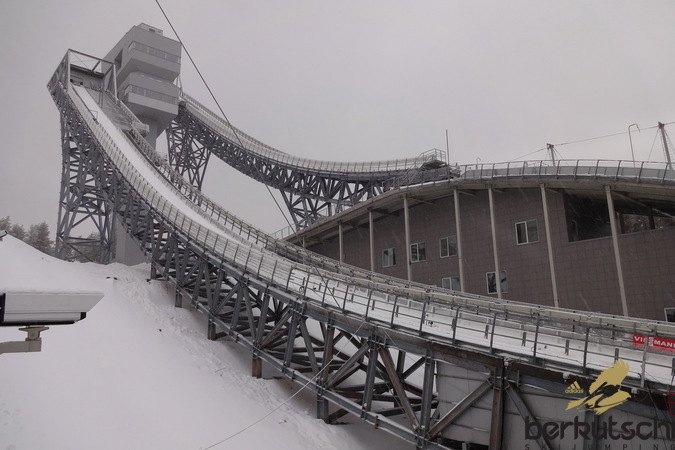 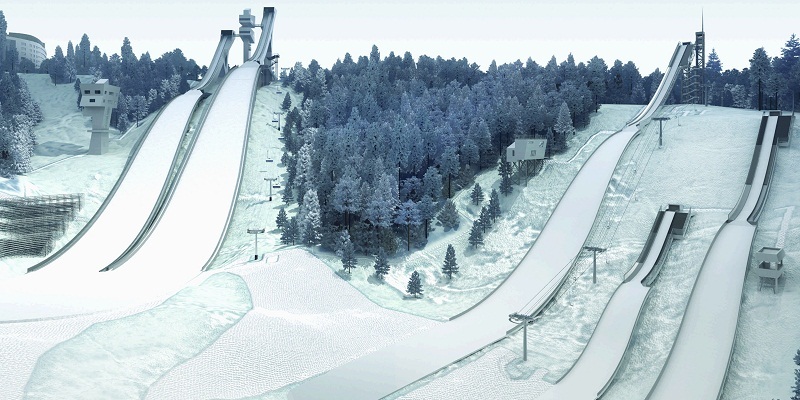 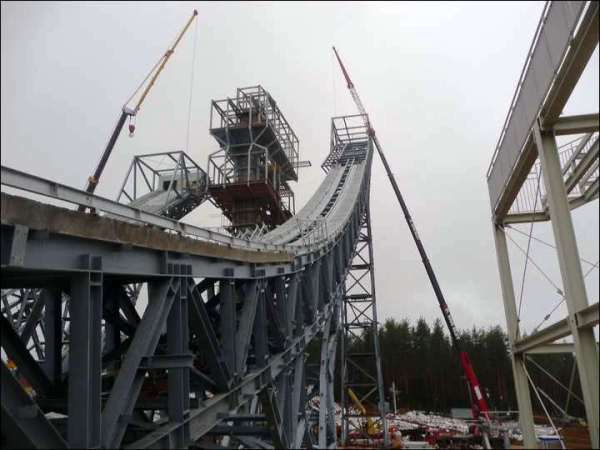 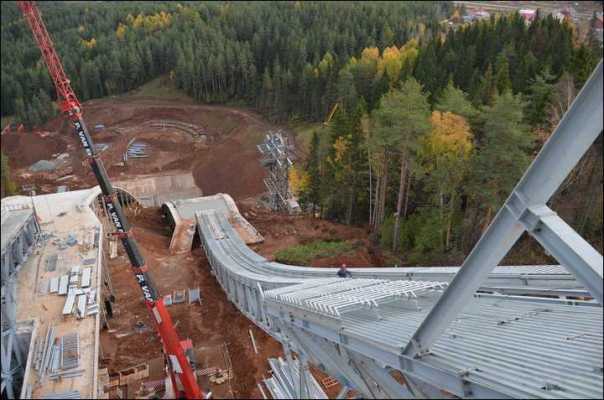 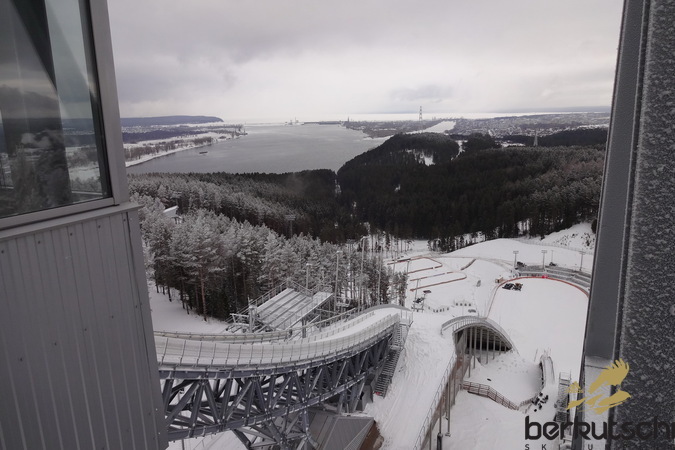 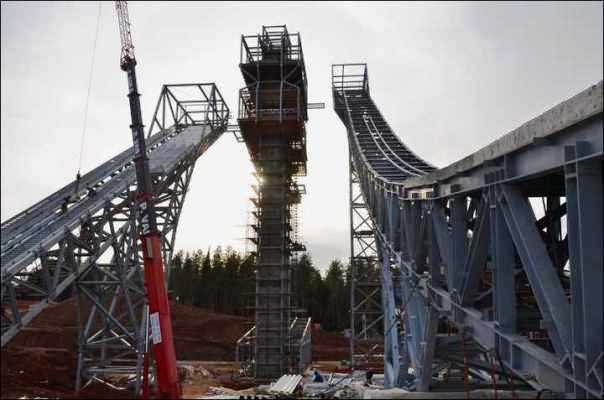 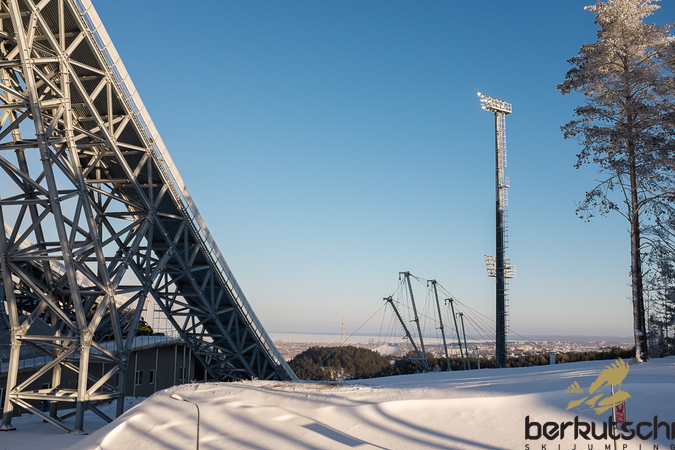 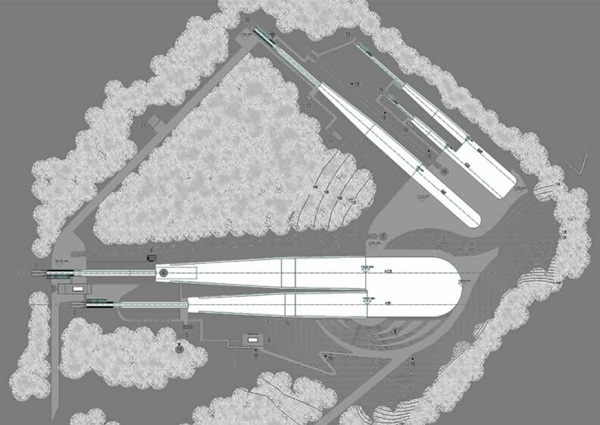 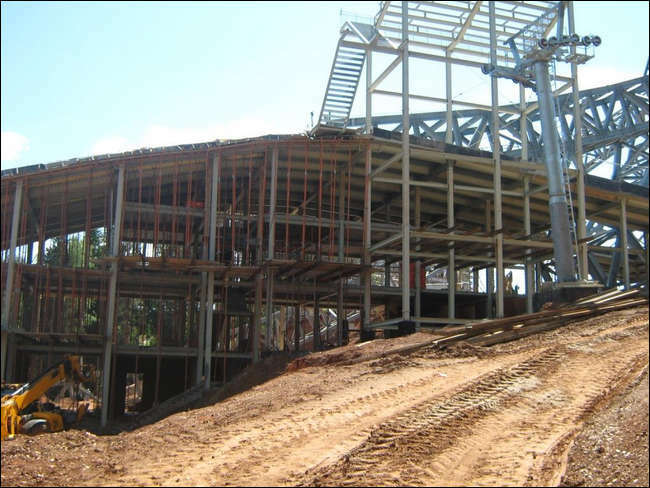 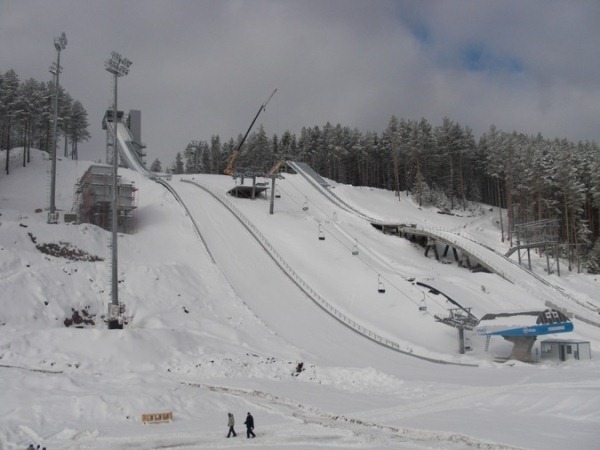 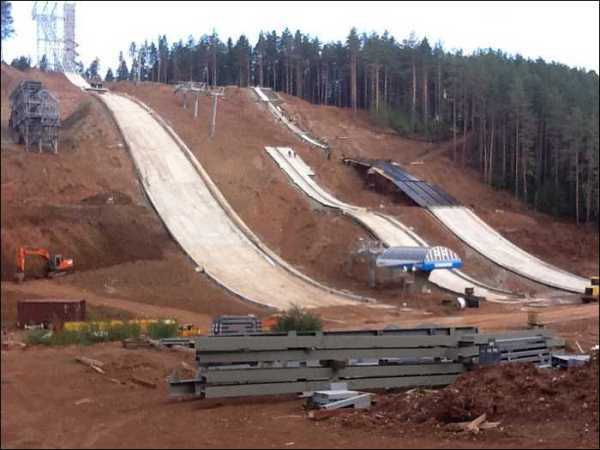 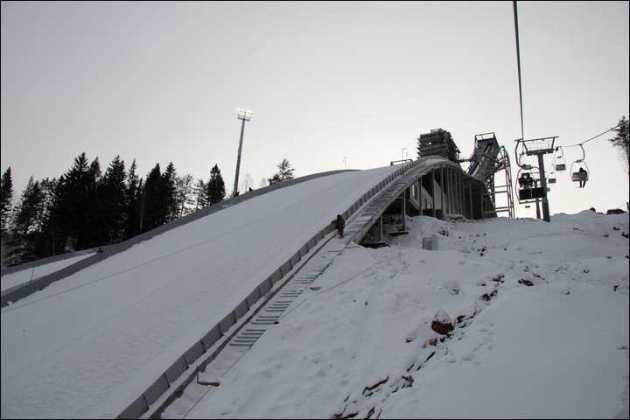 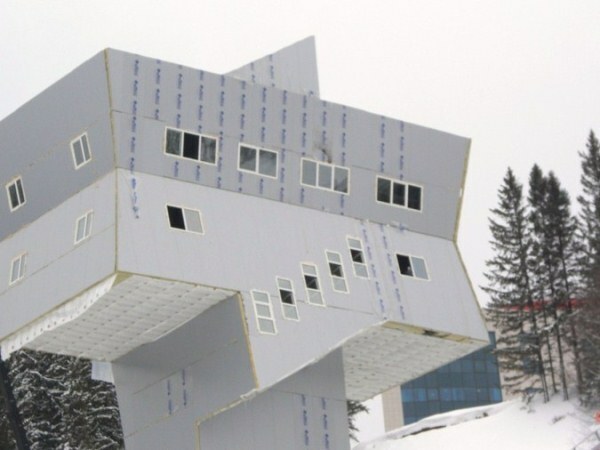 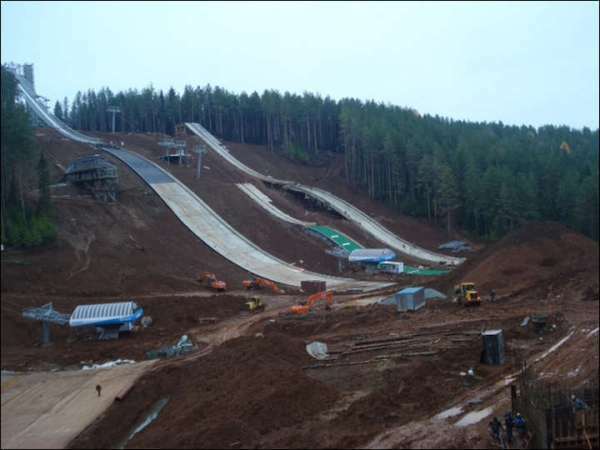 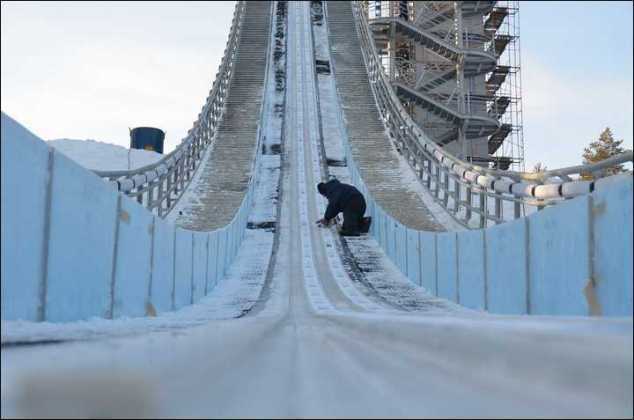 Originally, the construction works should have been completed by end of 2011 and then the first tests were scheduled for early February 2012 with a Continental Cup of Nordic Combined. 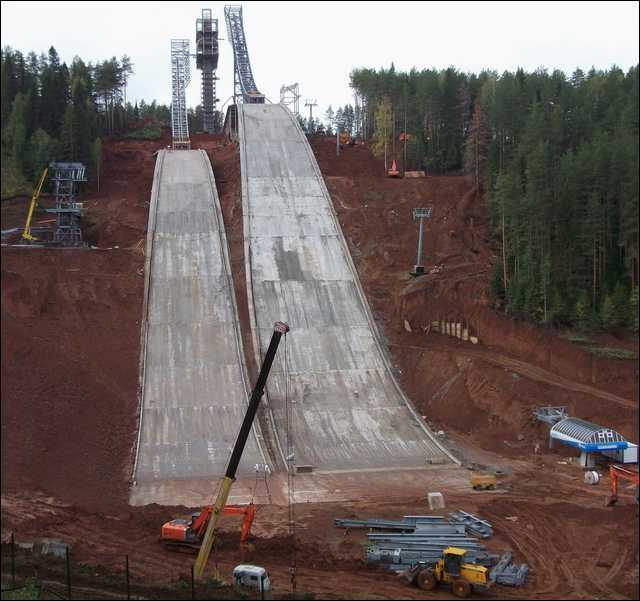 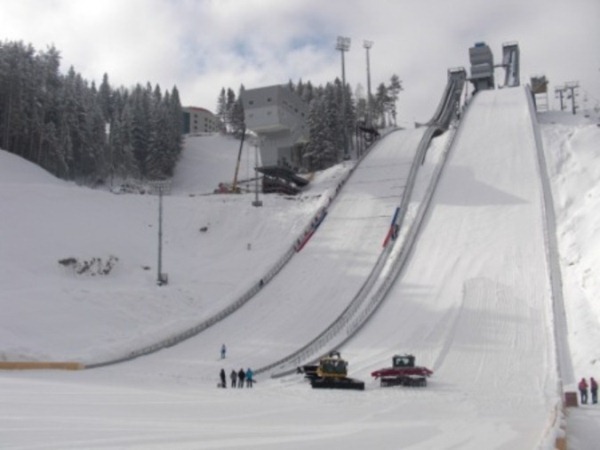 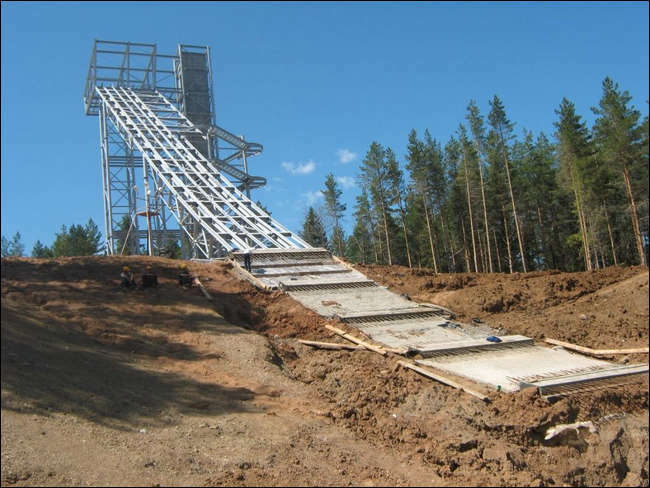 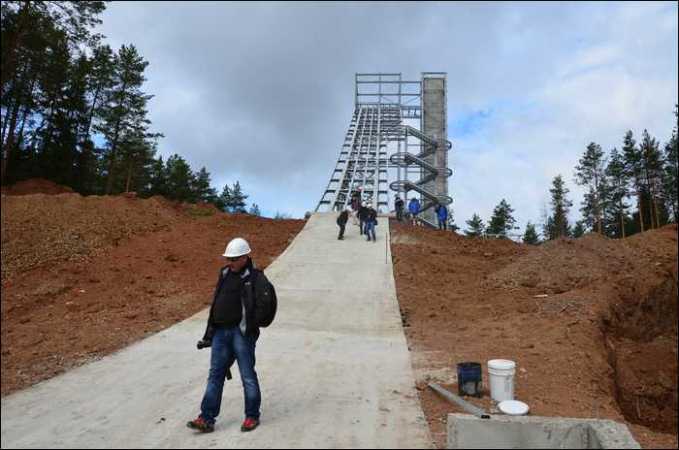 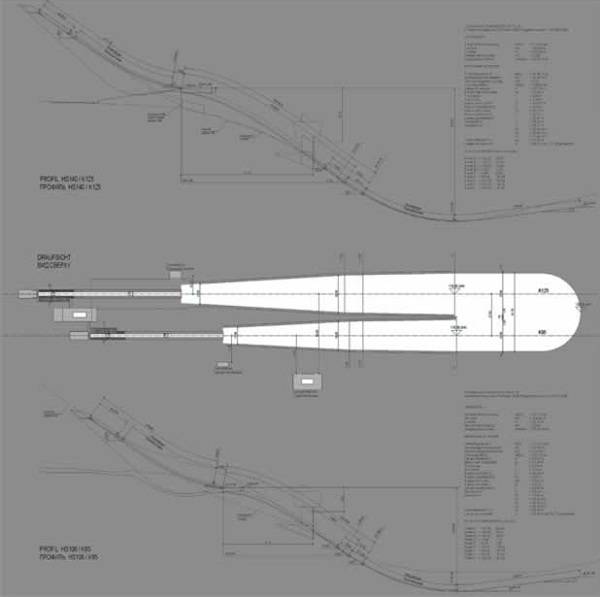 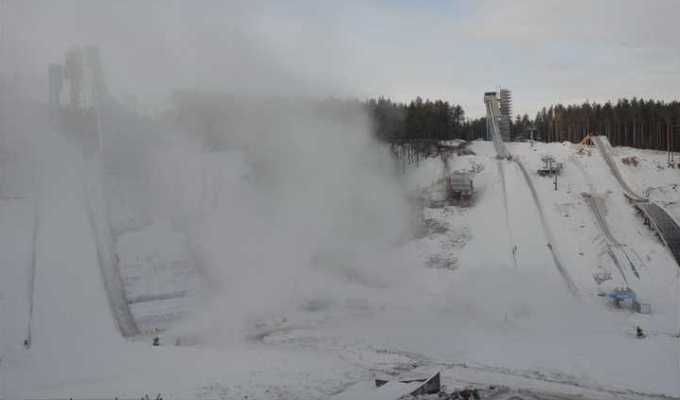 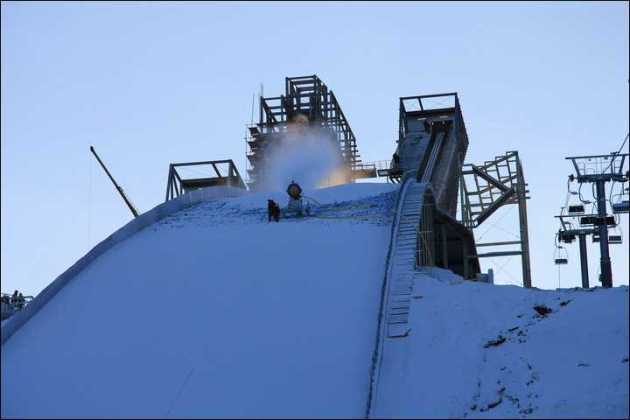 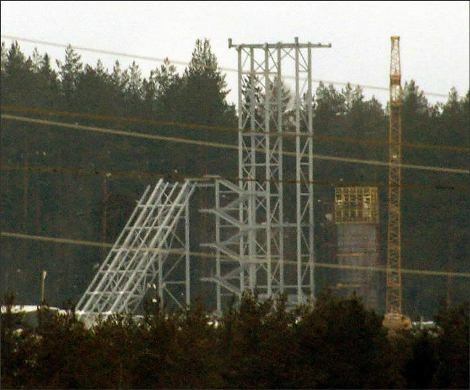 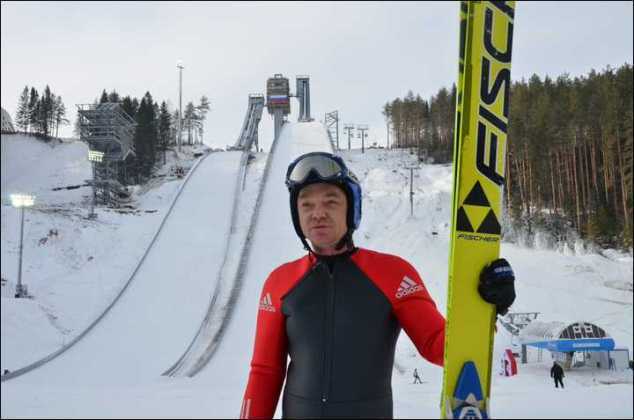 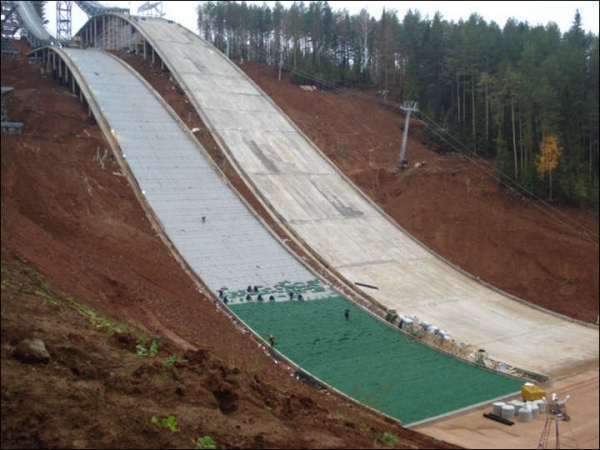 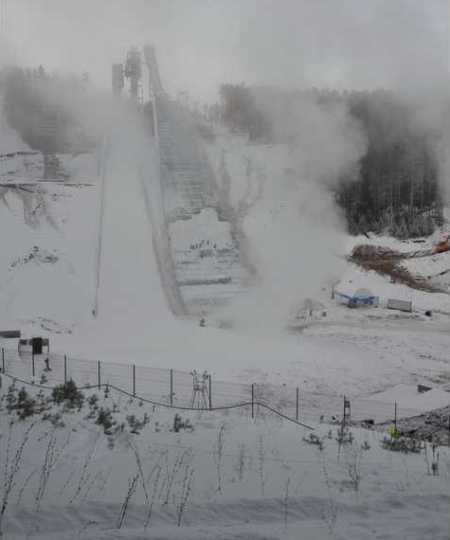 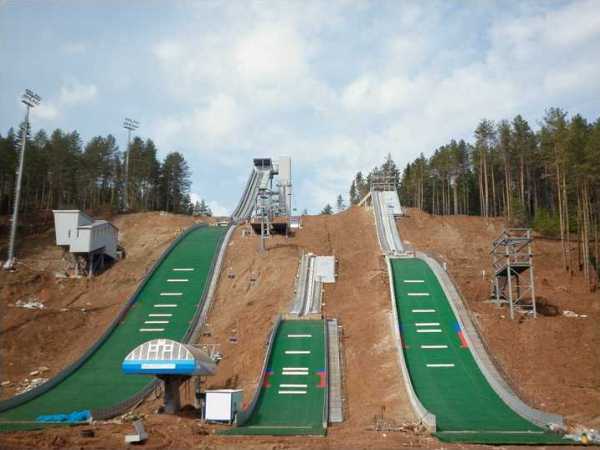 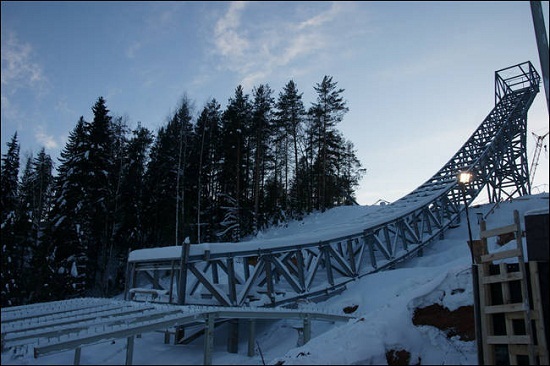 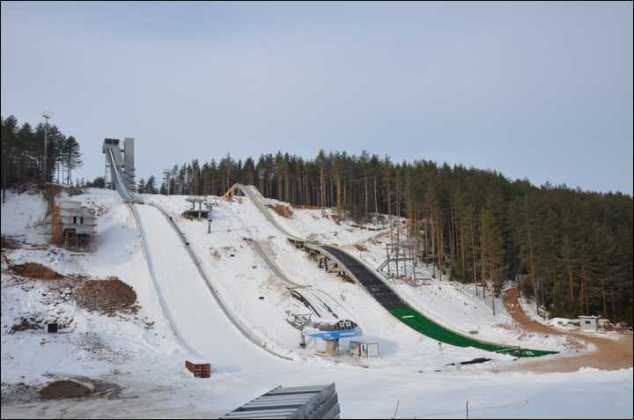 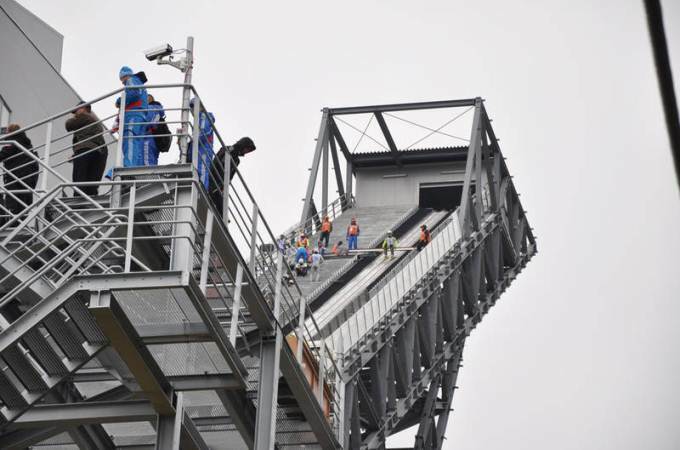 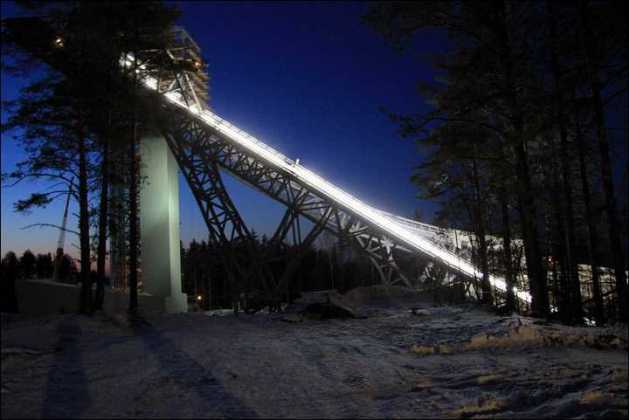 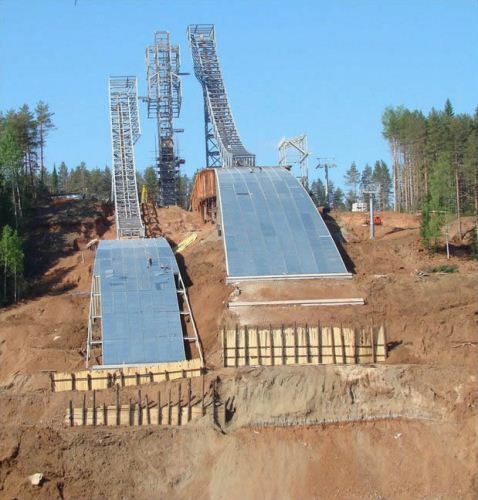 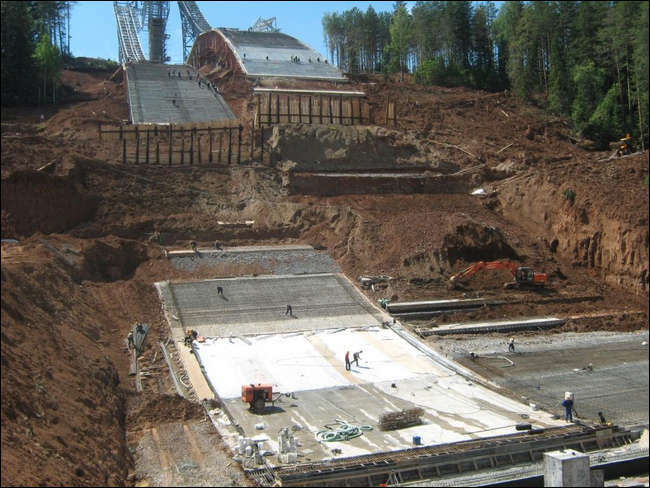 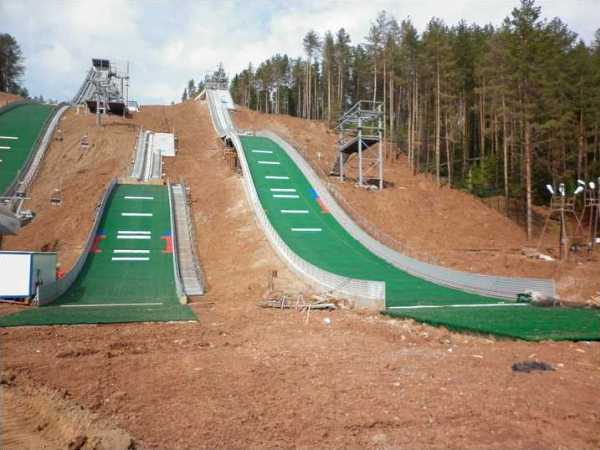 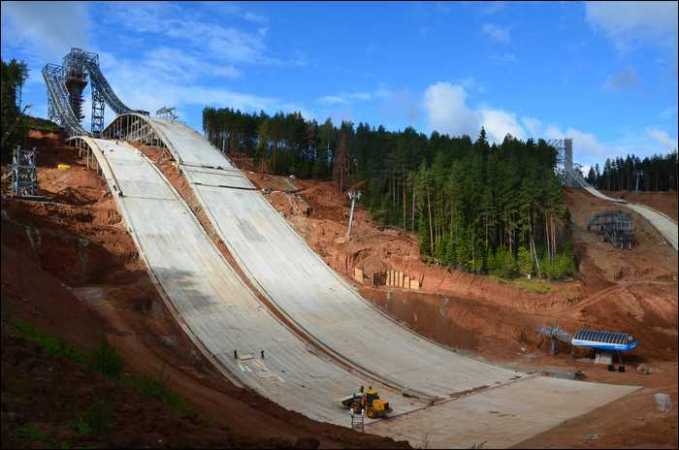 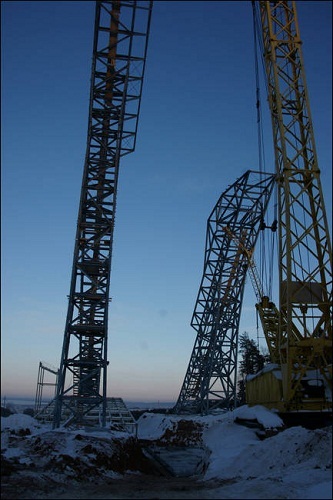 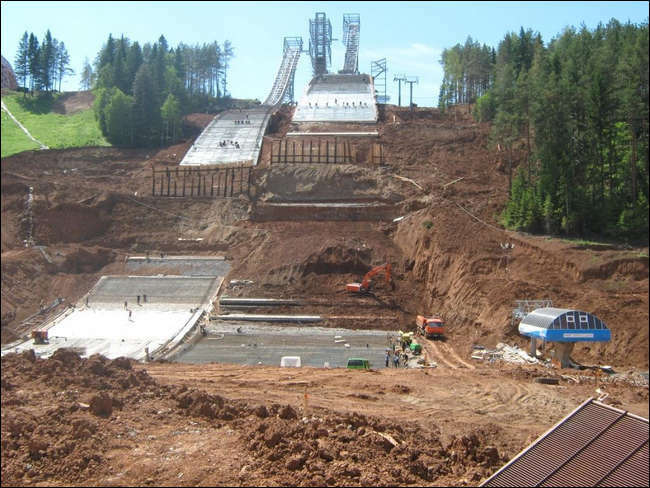 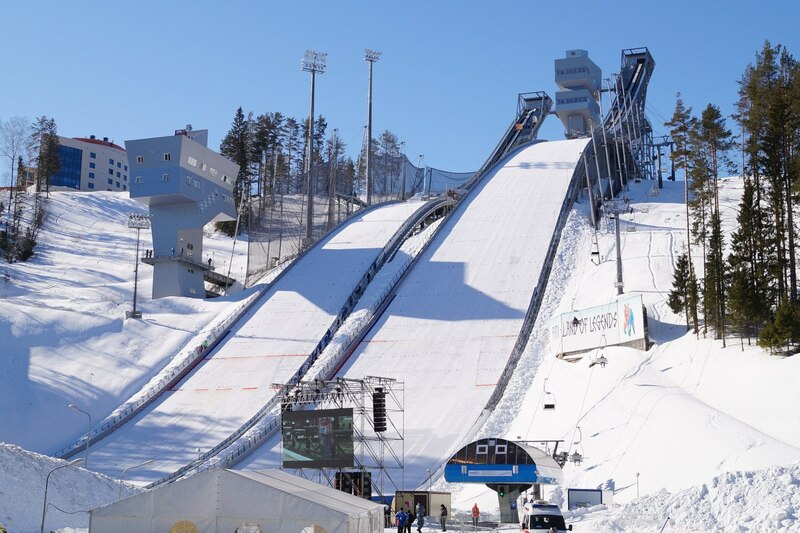 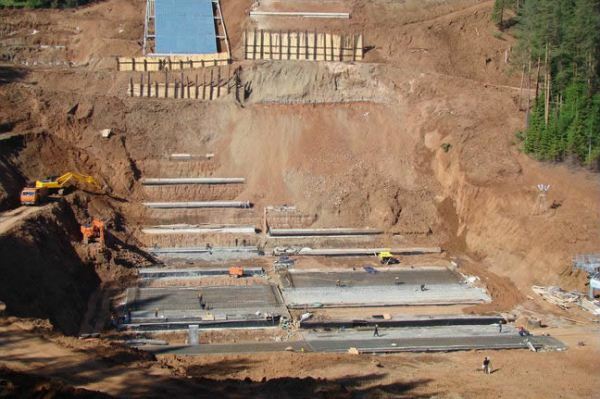 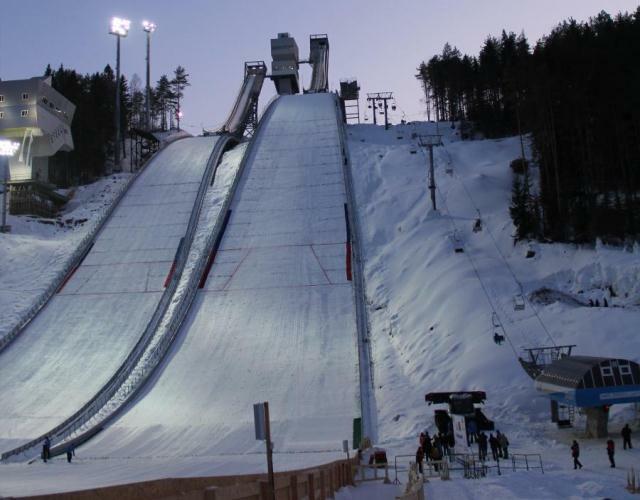 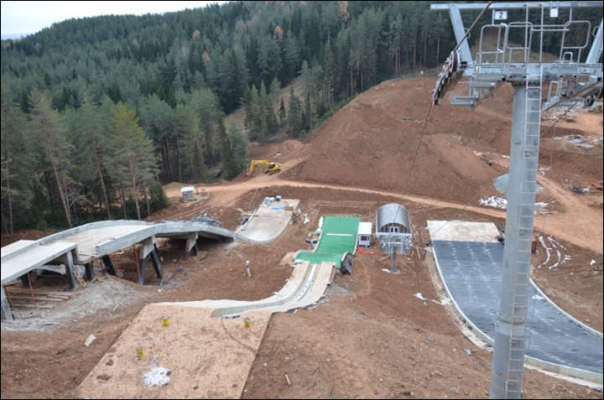 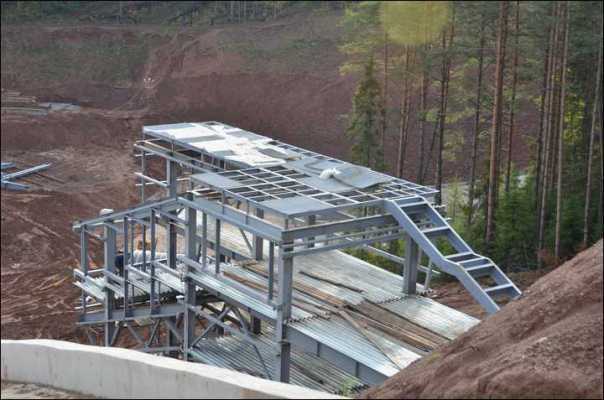 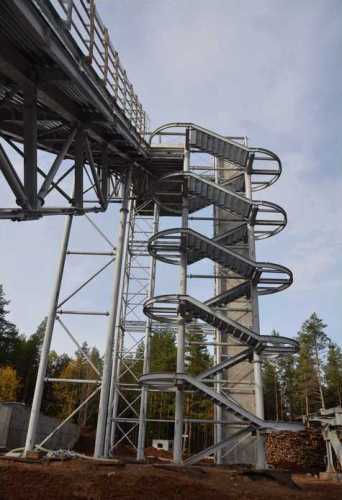 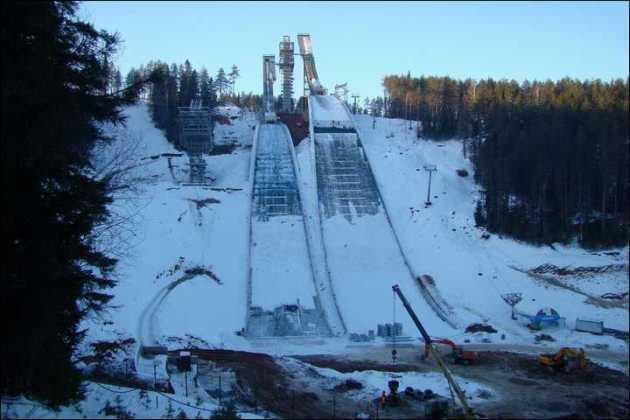 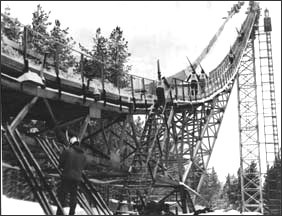 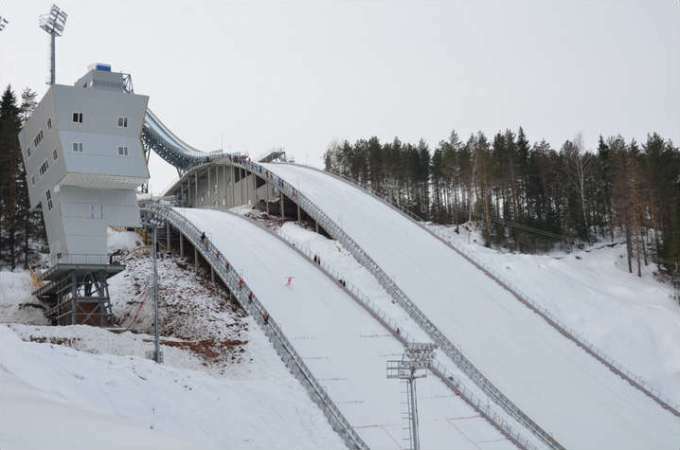 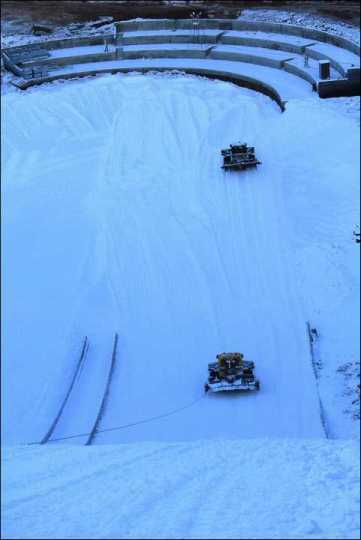 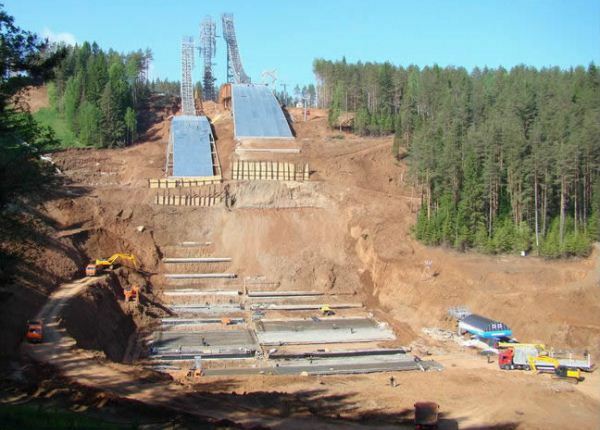 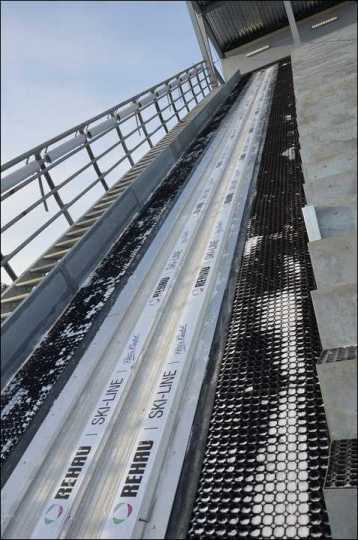 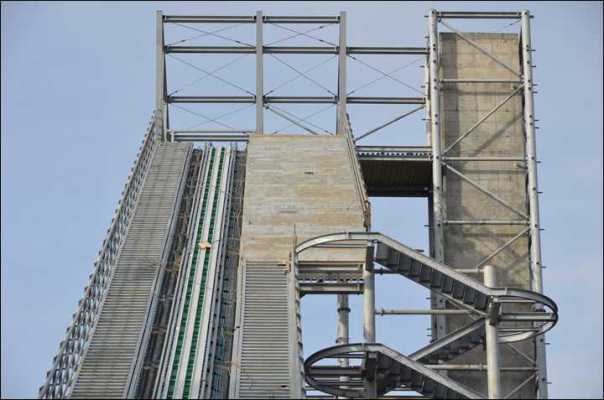 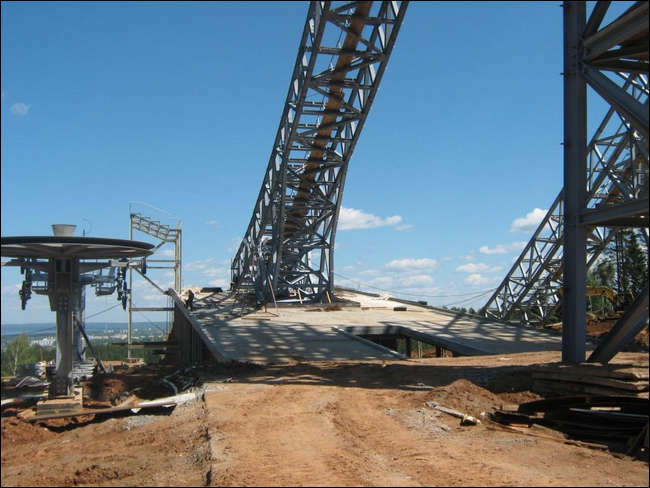 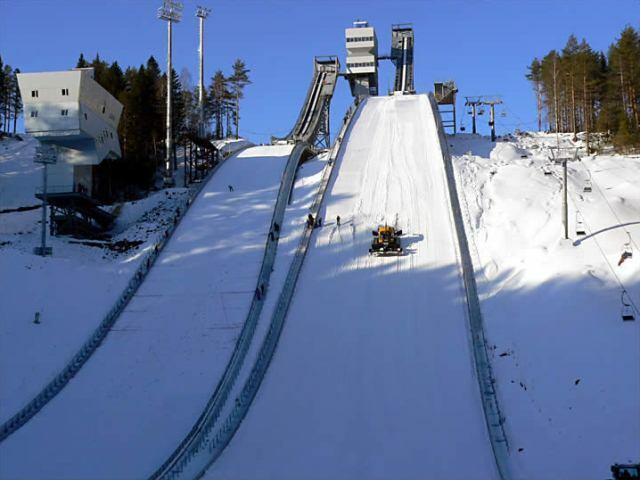 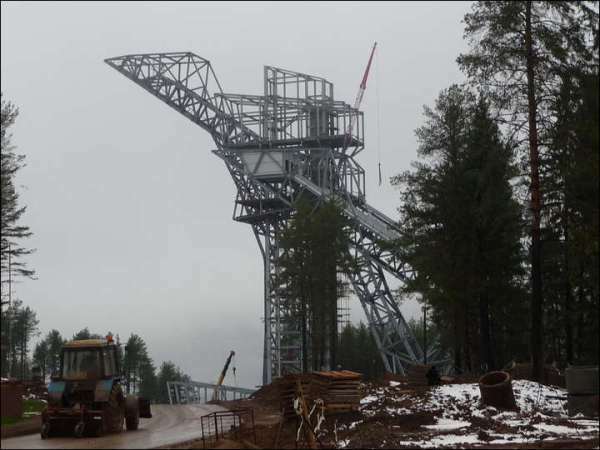 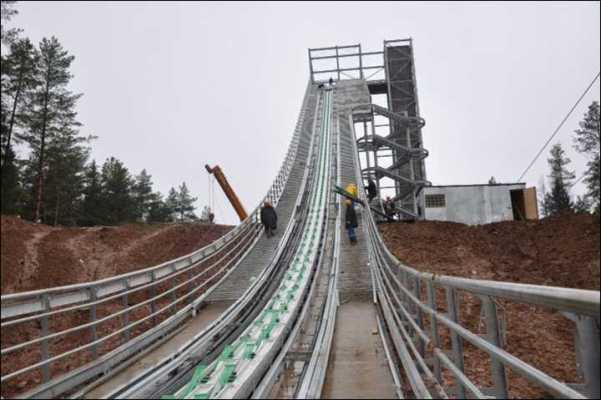 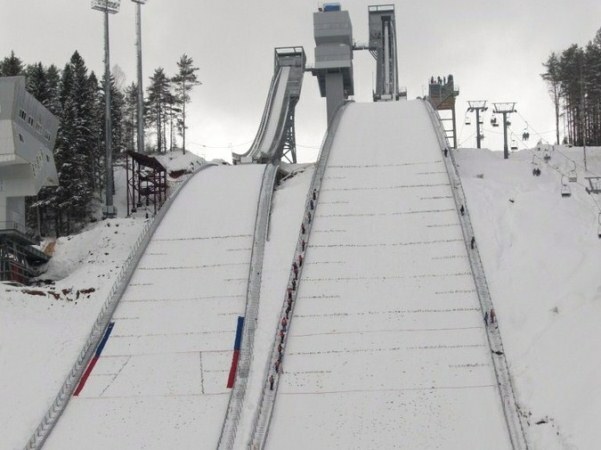 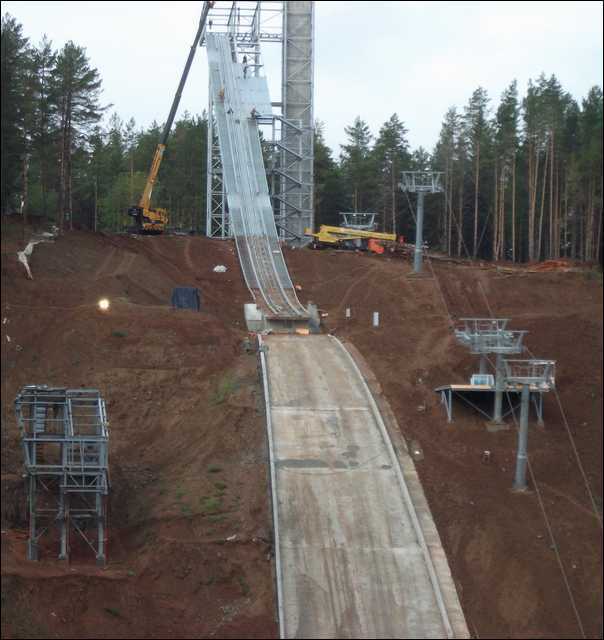 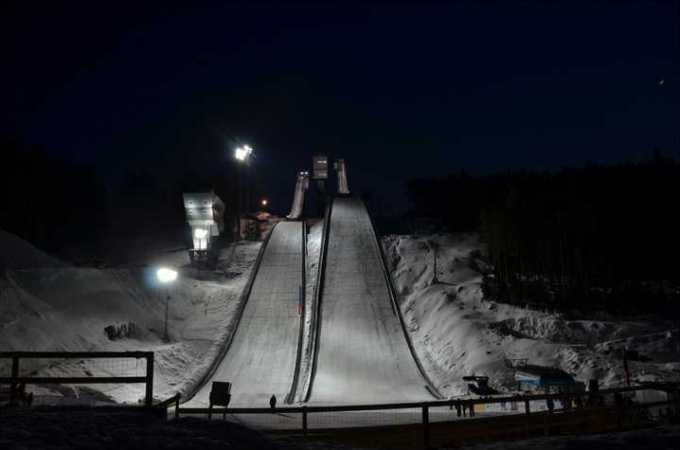 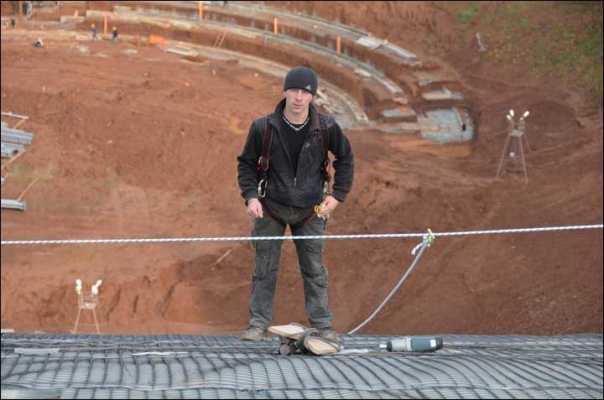 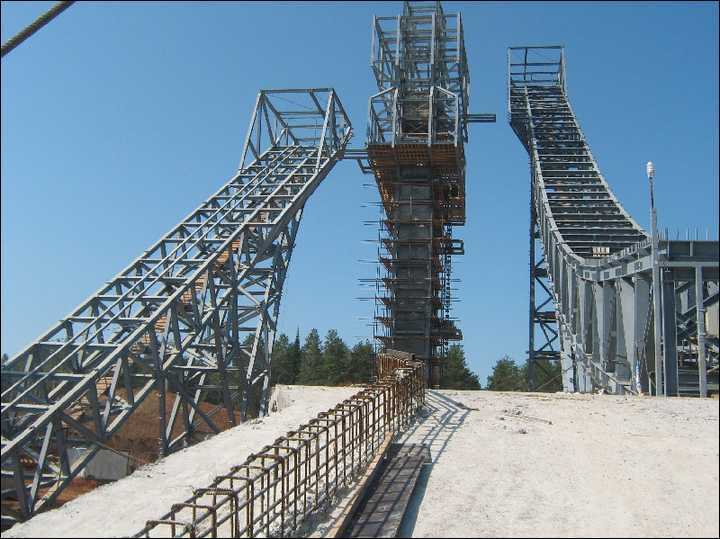 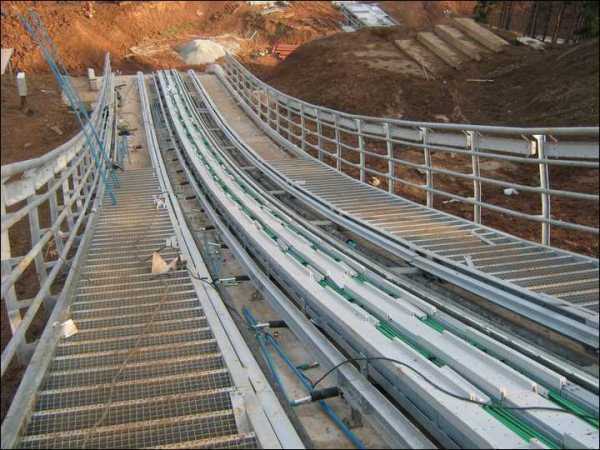 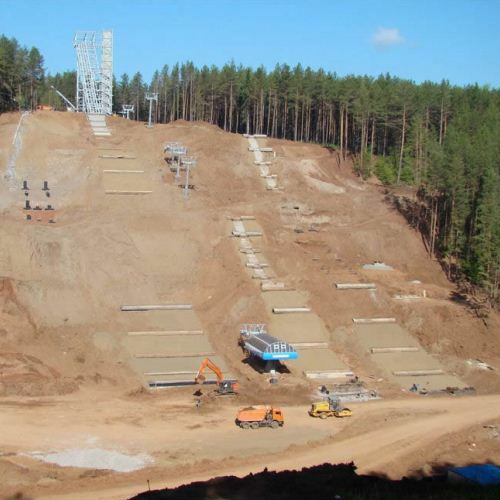 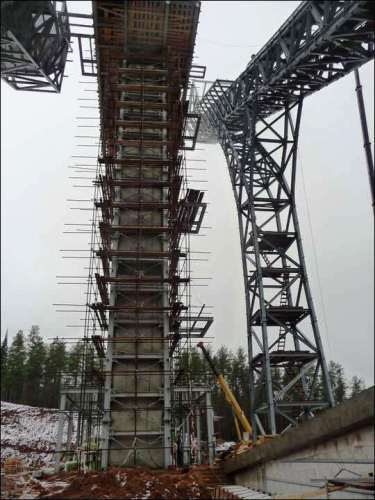 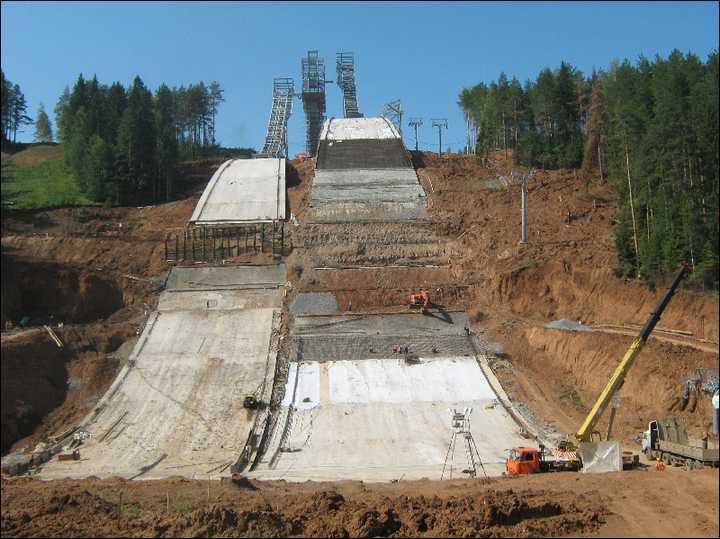 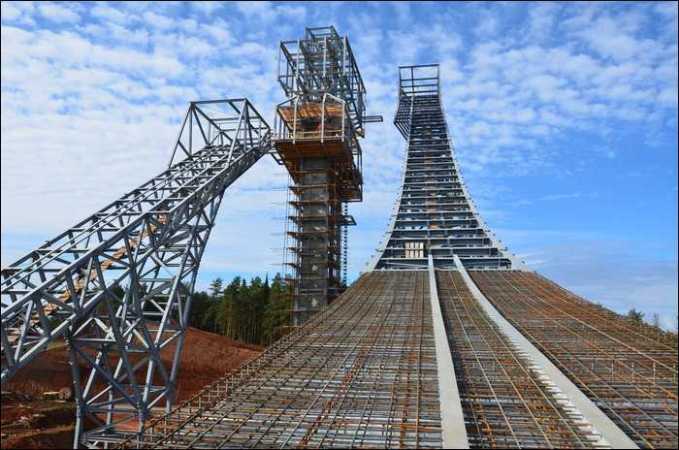 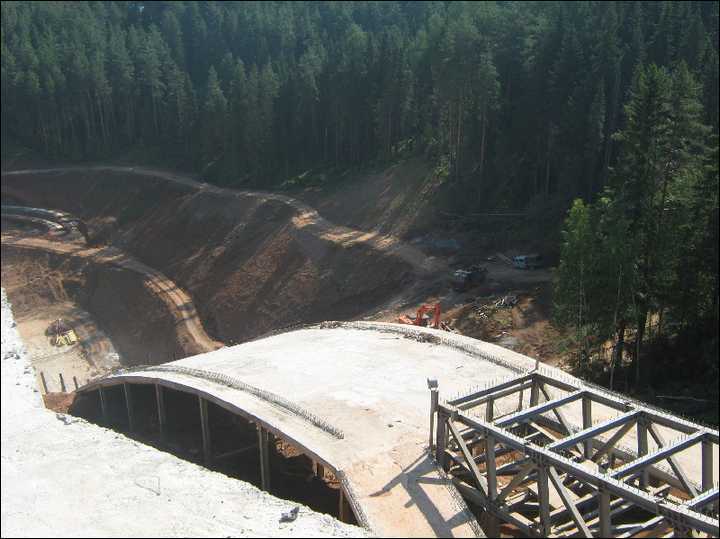 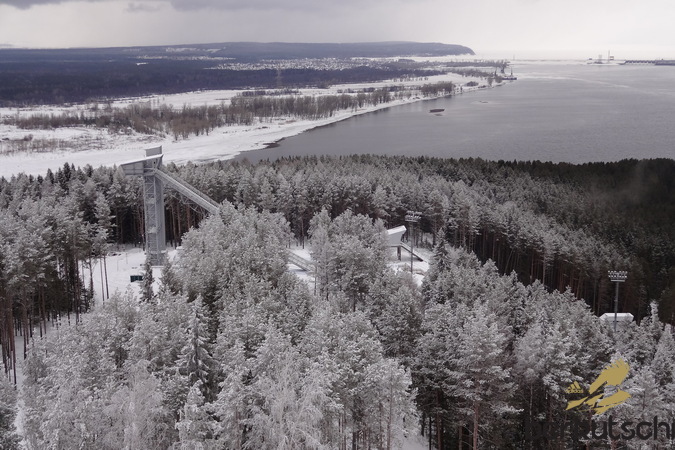 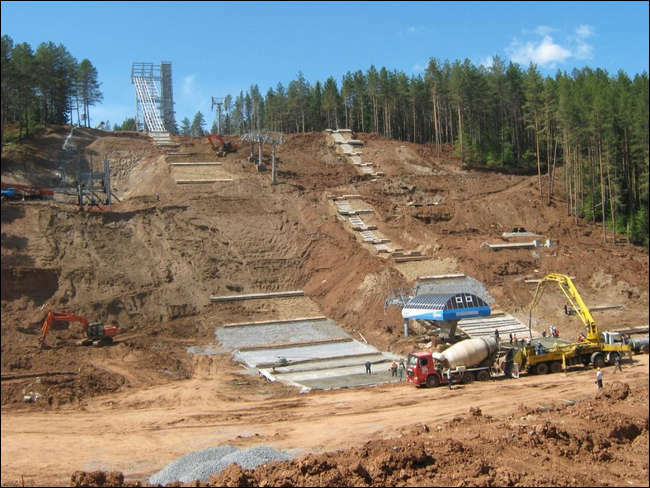 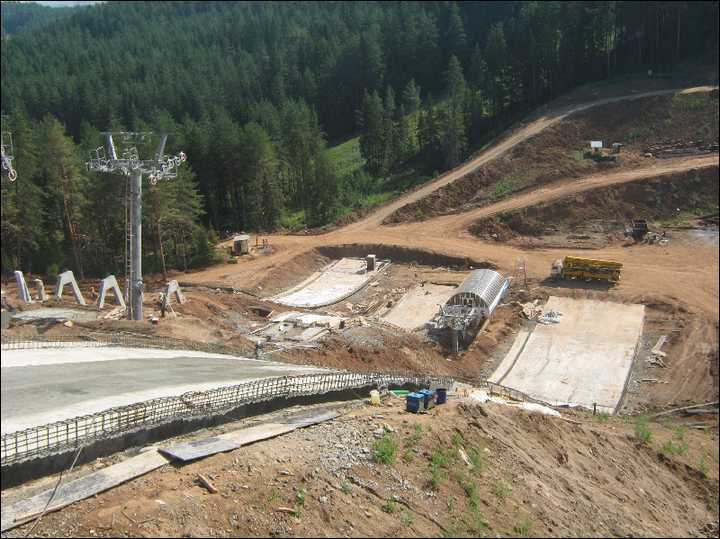 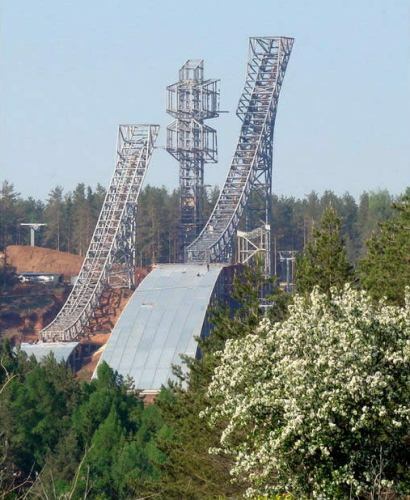 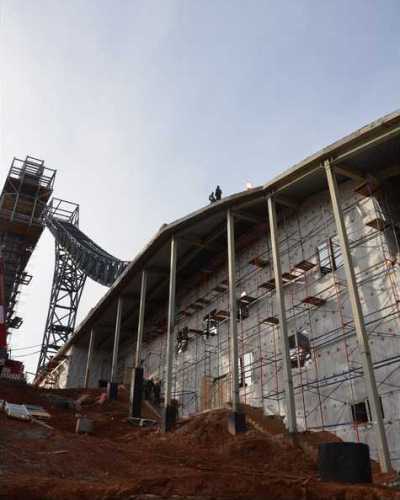 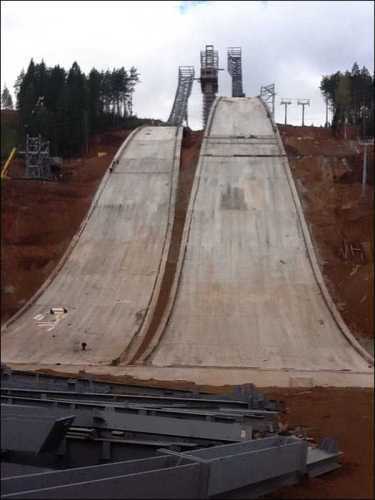 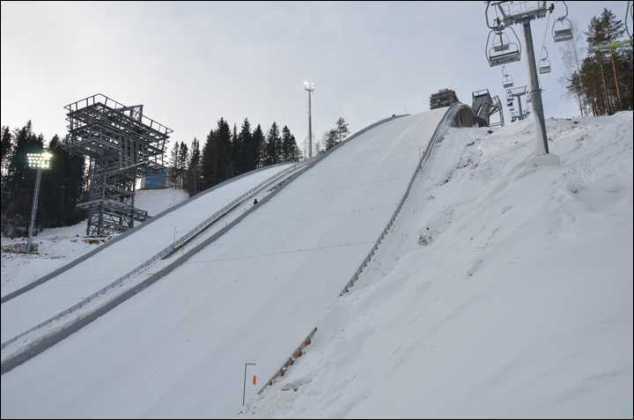 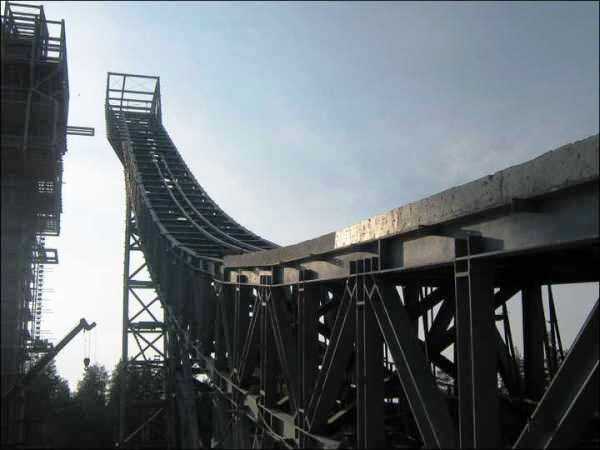 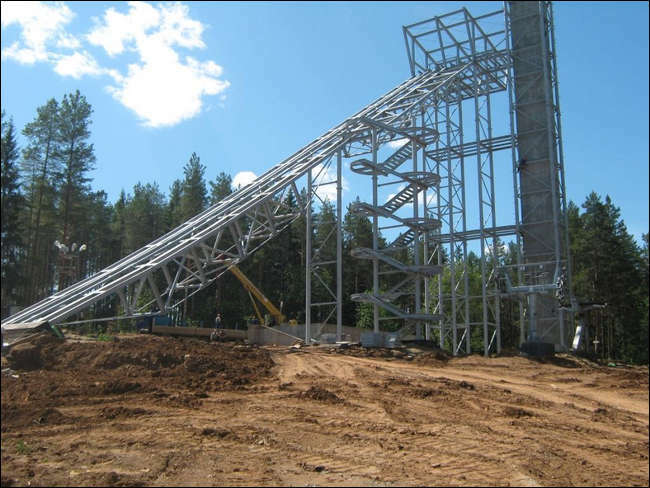 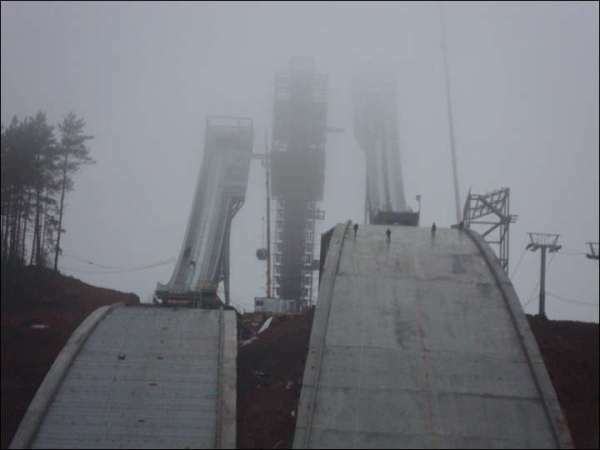 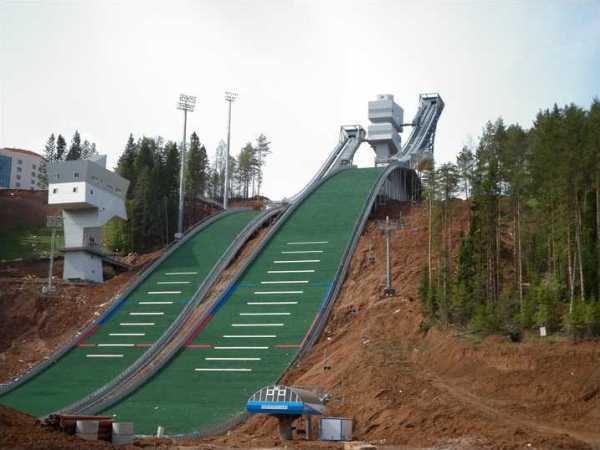 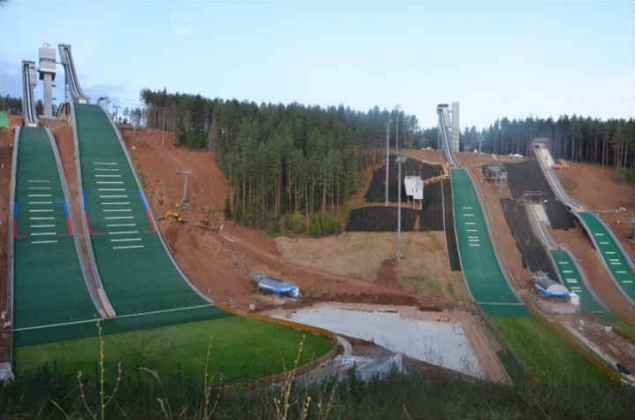 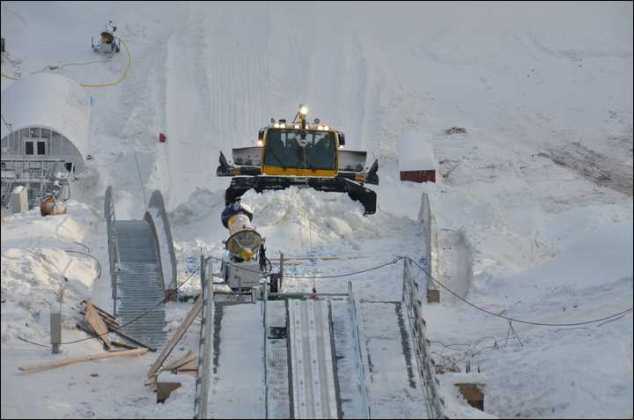 But the final completion and approval was delayed and the very first ski jumps on the hills K65, K95 and K125 took place on February 4, 15 and 16 2012. 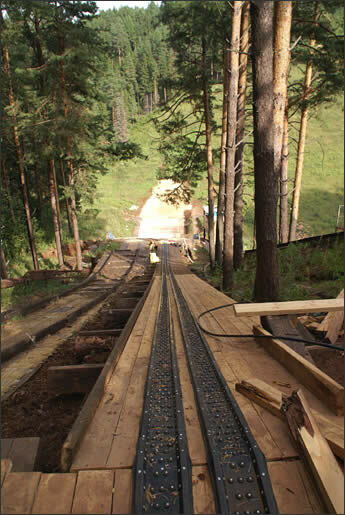 The larger hills were even equipped with SKI-Line inrun tracks with jumping dynamics measuring systems. 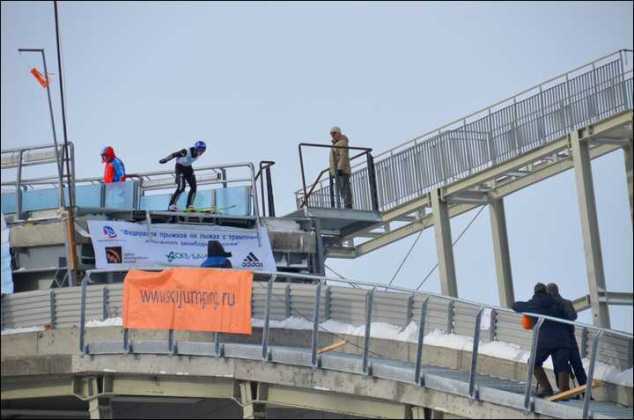 The Russian championships were held there from March 22 to 26, 2012 and the first international competitions with two Continental Cups were oragnized in September 2012. 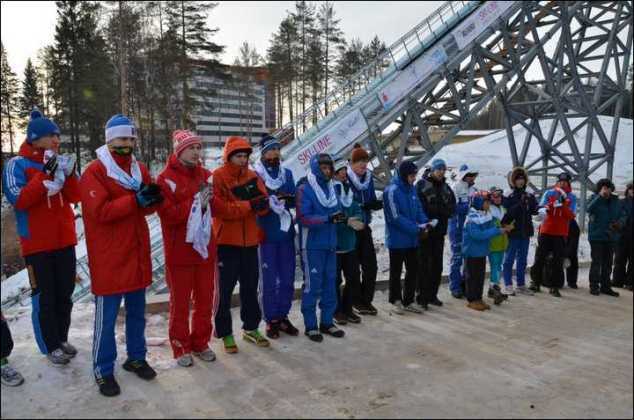 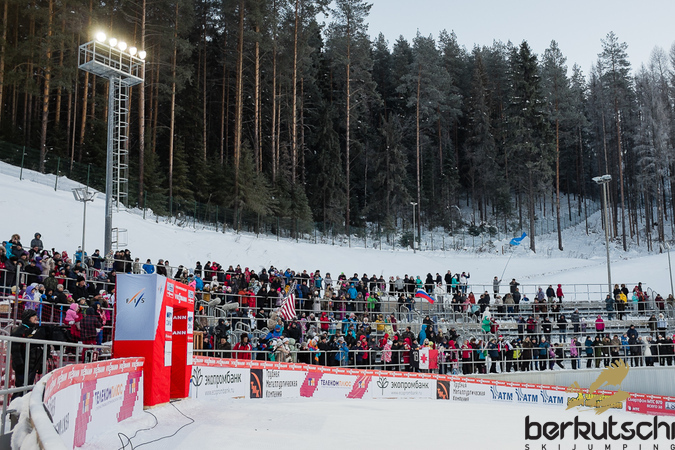 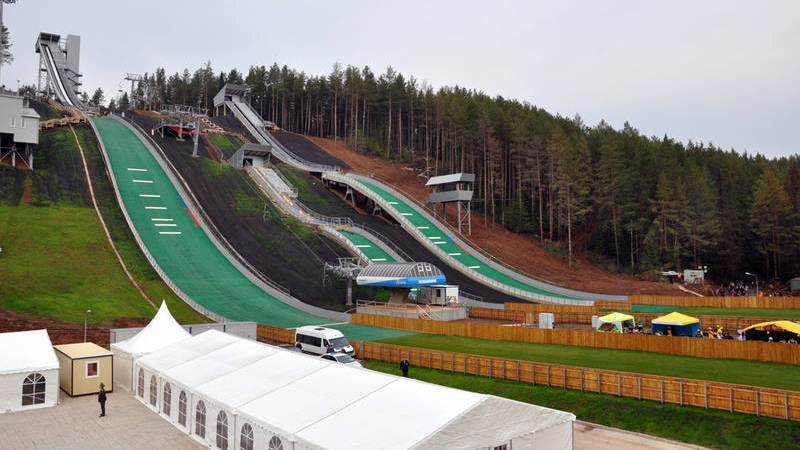 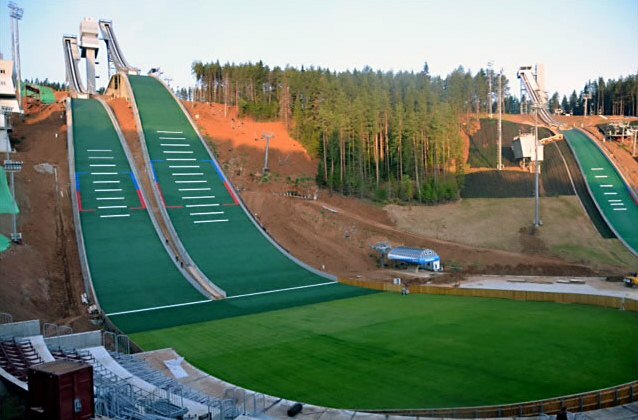 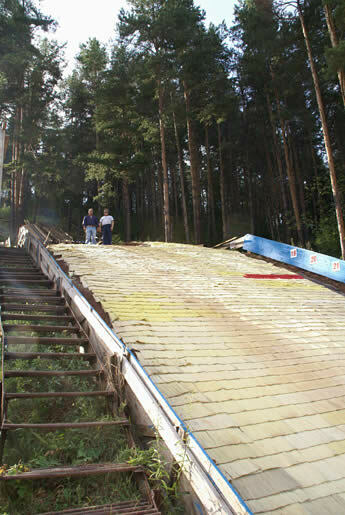 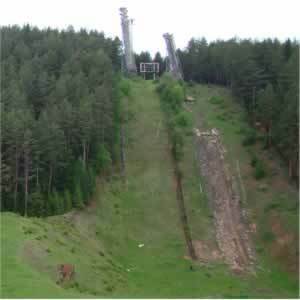 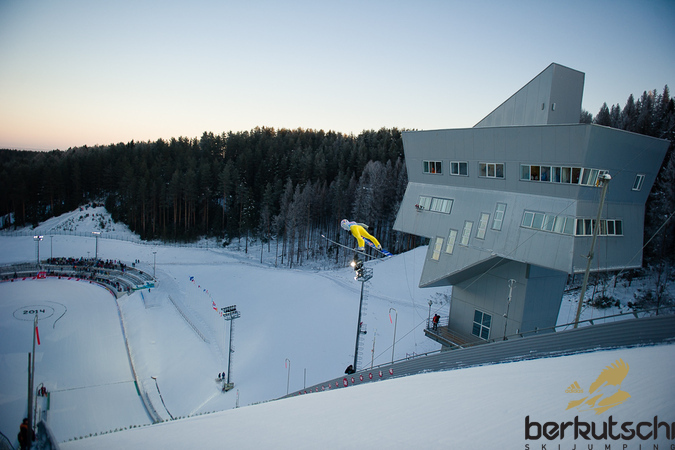 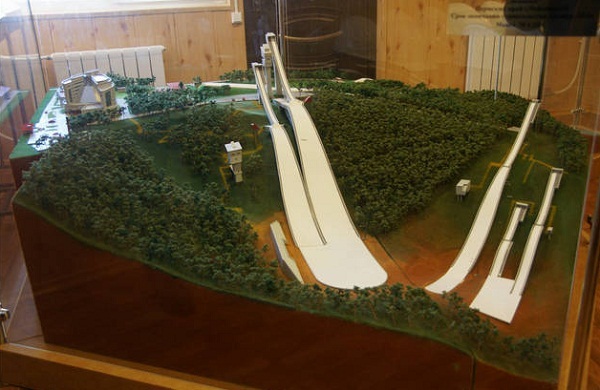 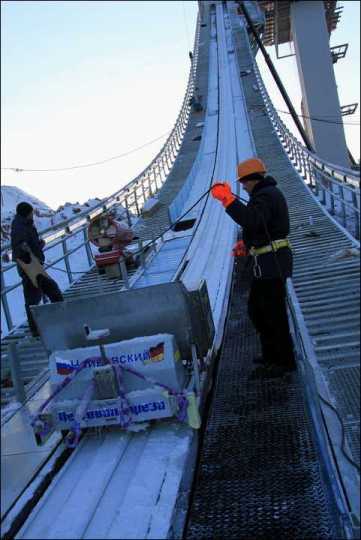 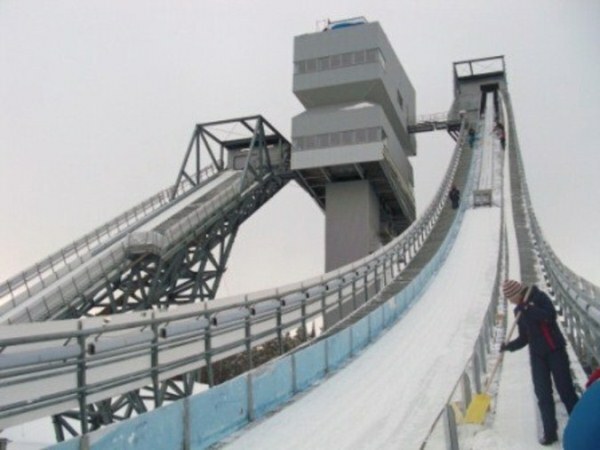 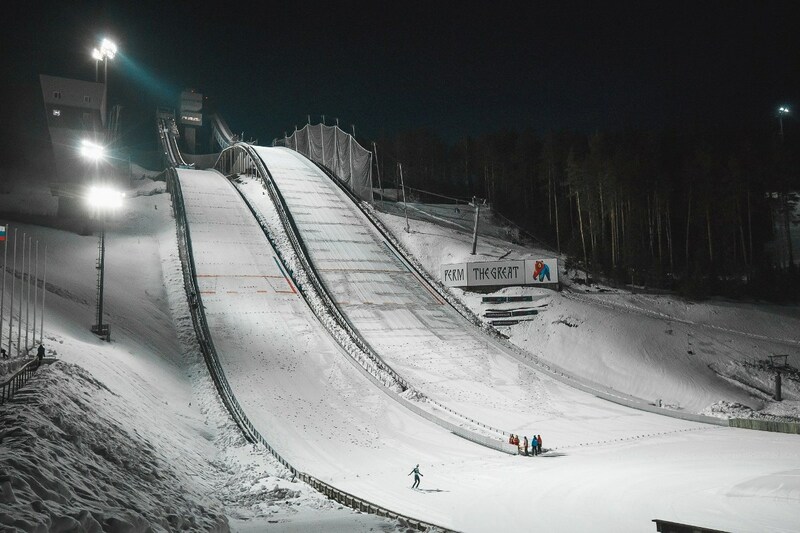 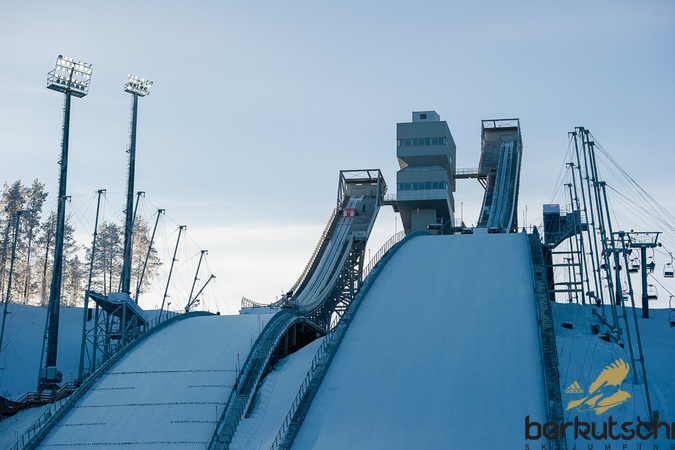 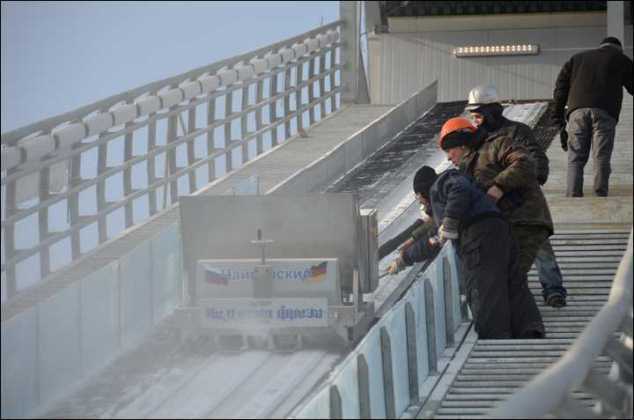 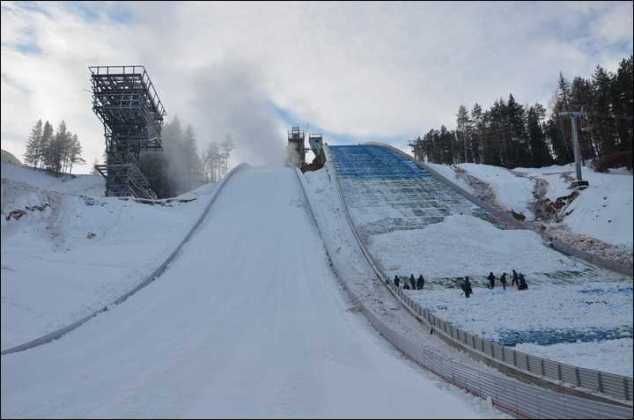 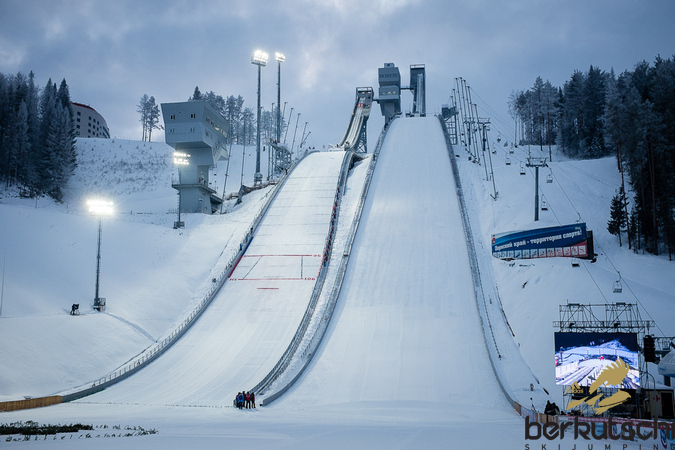 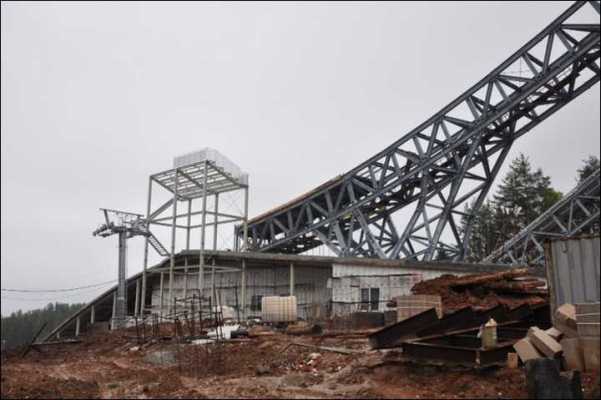 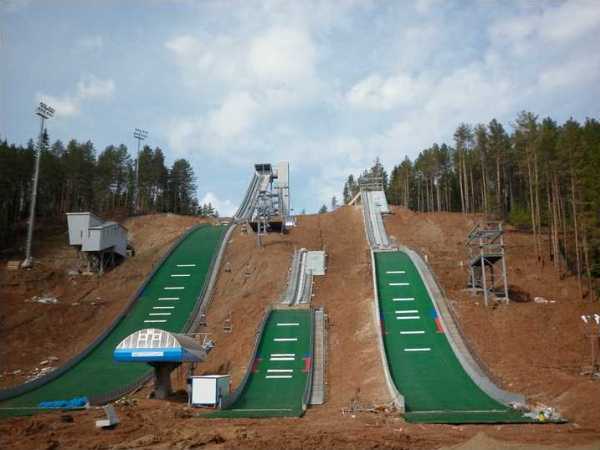 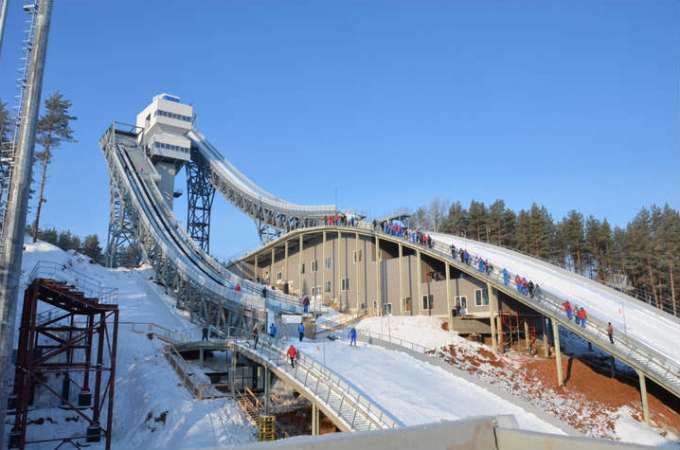 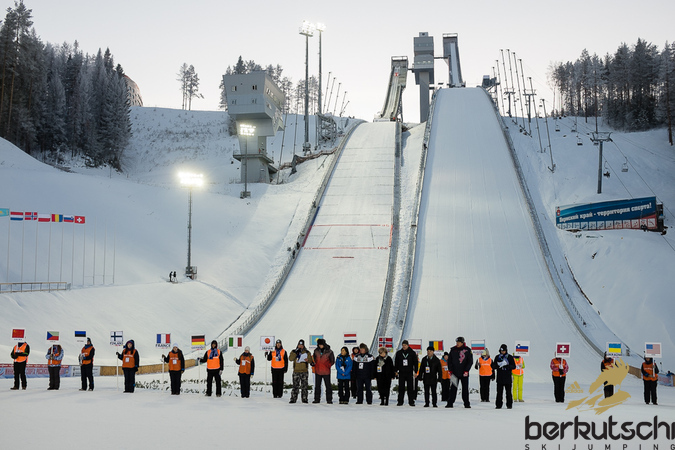 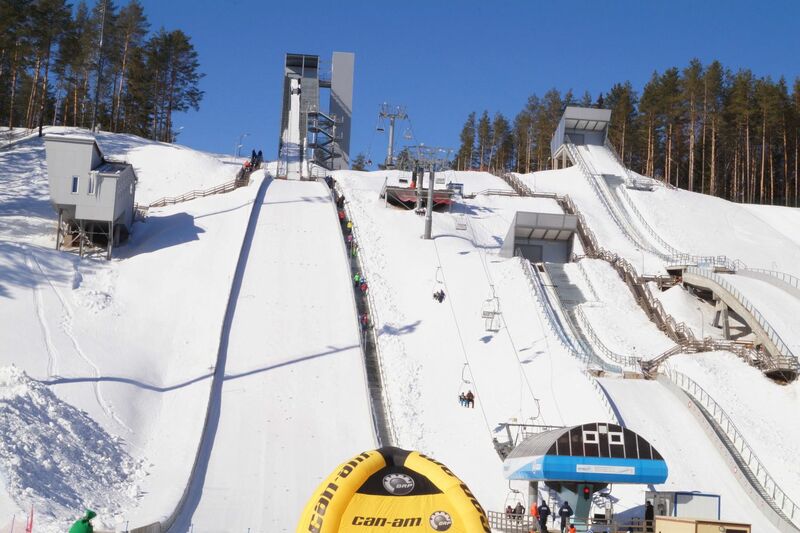 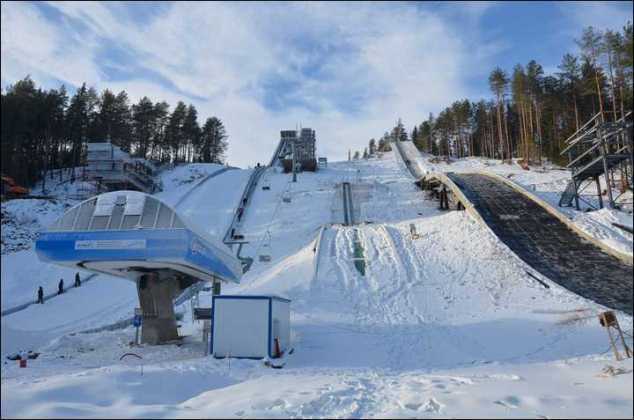 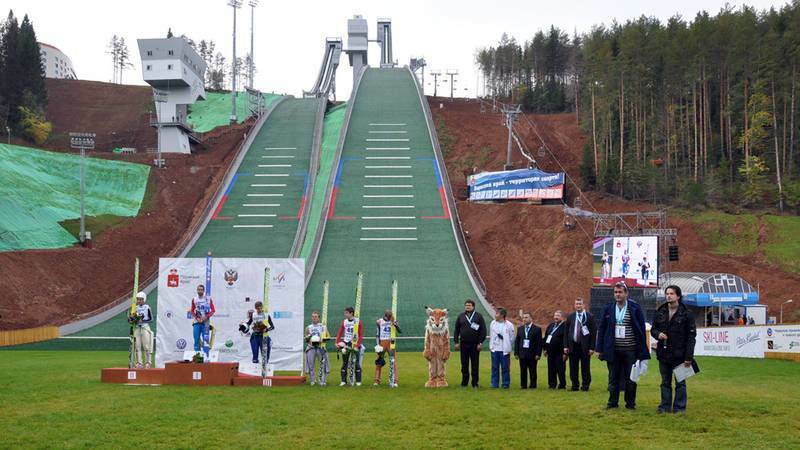 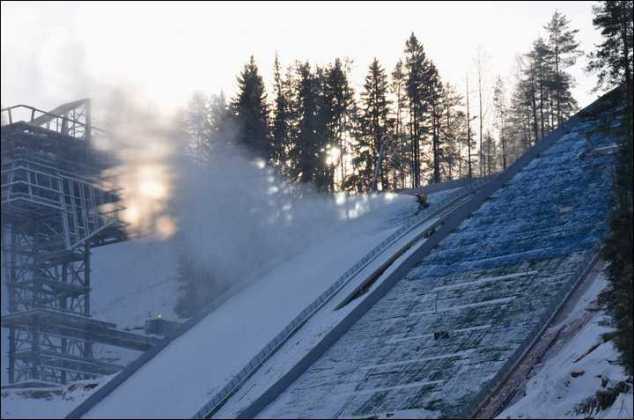 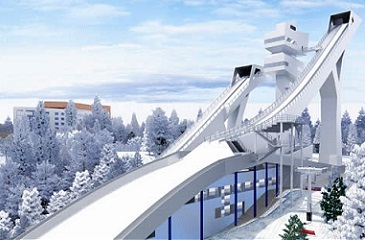 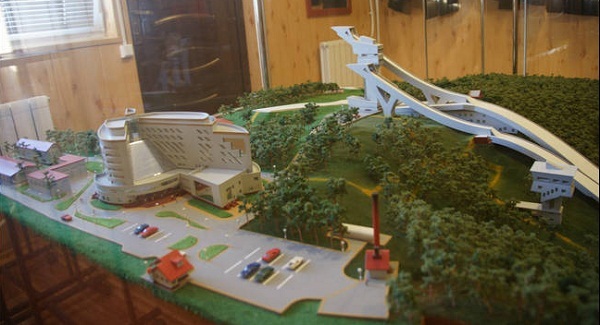 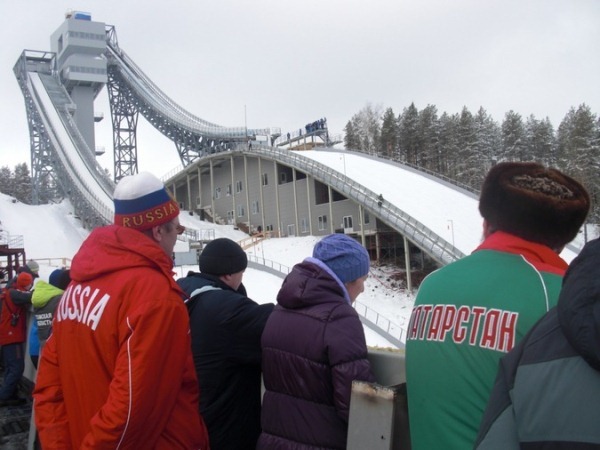 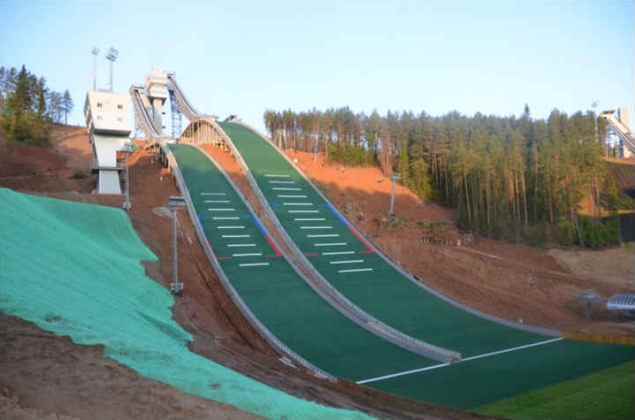 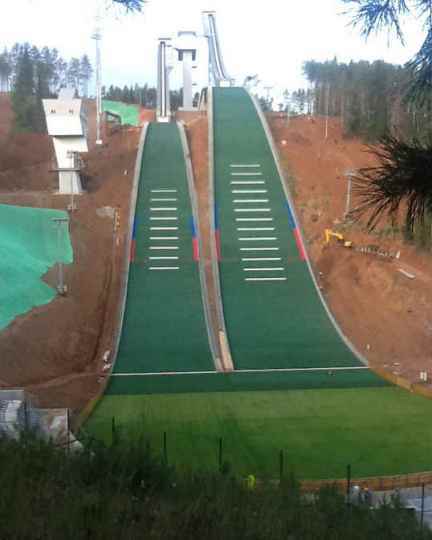 The Snezhinka ski jumping center with the plastic covered hills K125, K95, K65, K40 and K20 has since been venue for many events, including World Cup competitions. 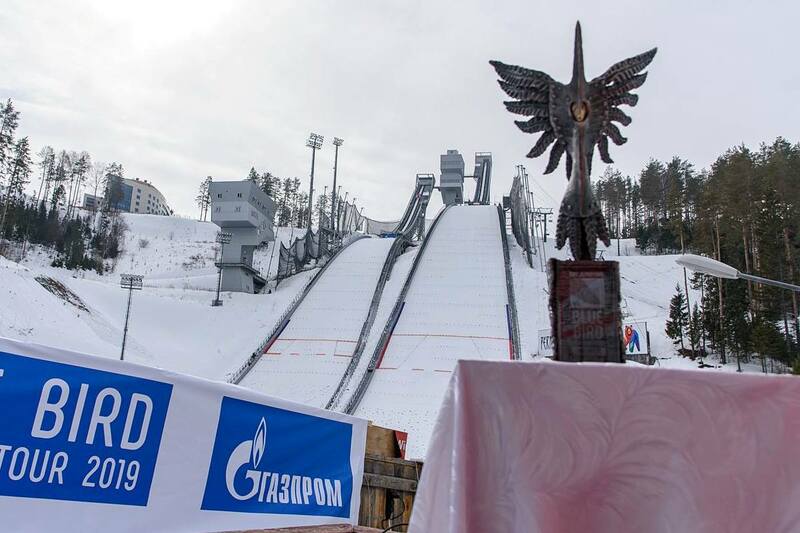 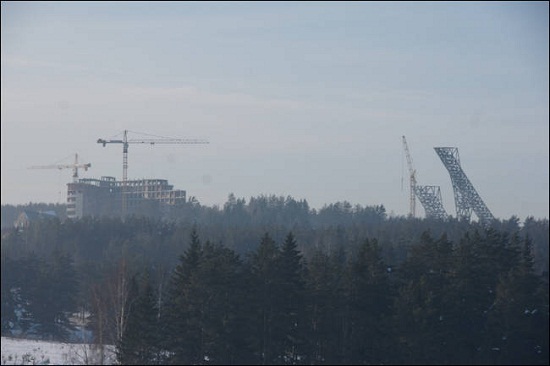 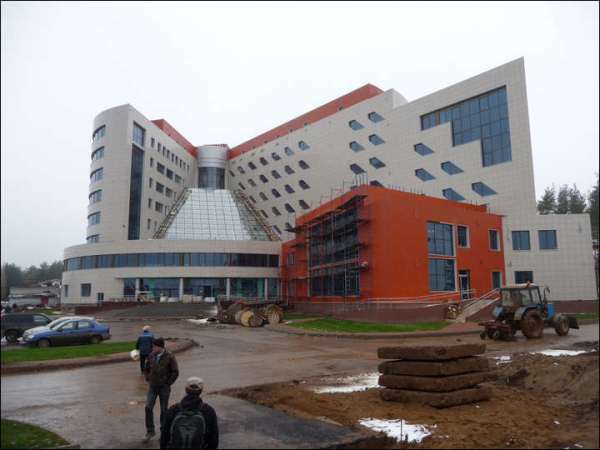 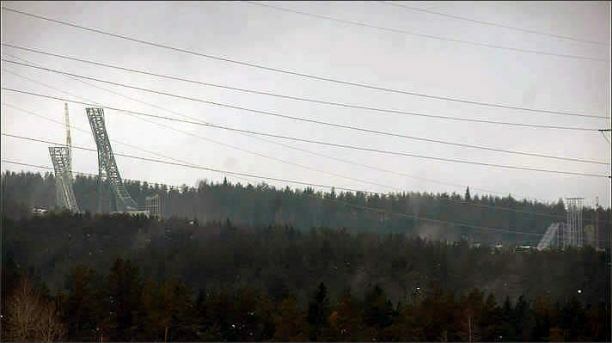 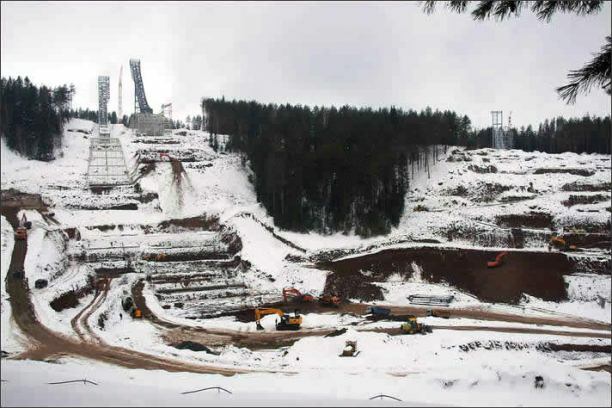 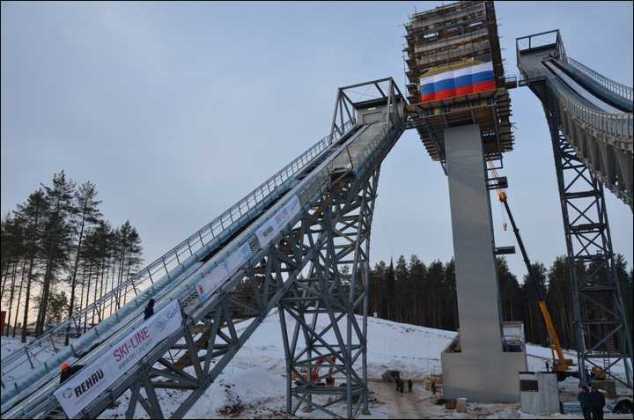 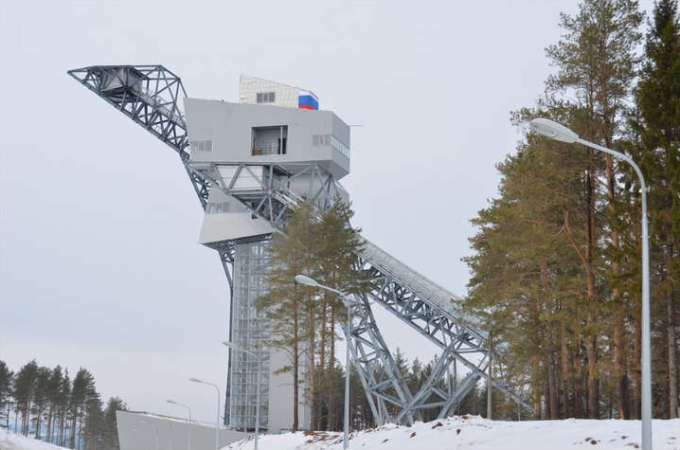 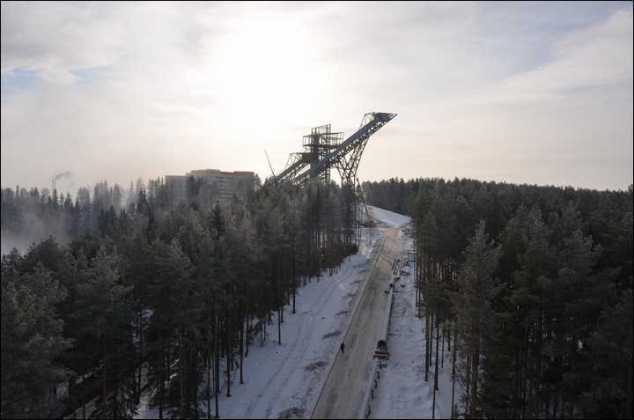 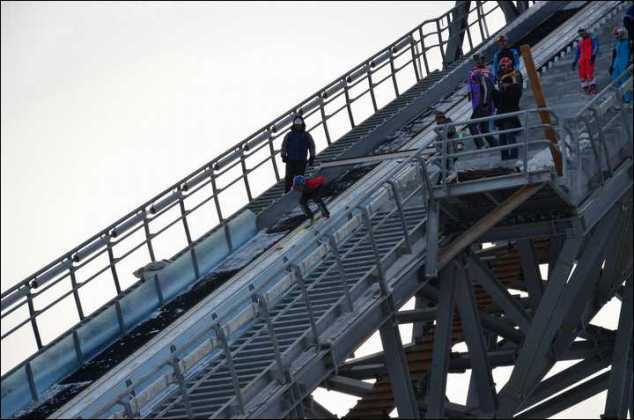 On February 5 Russian prime minister is going to pay a visit to the ski jumping hill construction site at Chaykovskiy and around a week later the first ski jump of Russian modernity will be inaugurated. 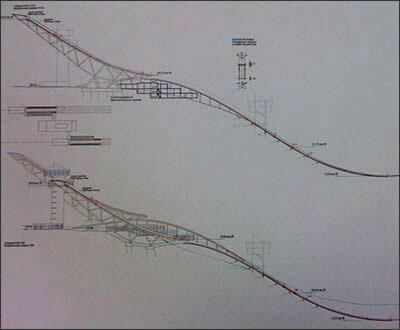 Kain problem. 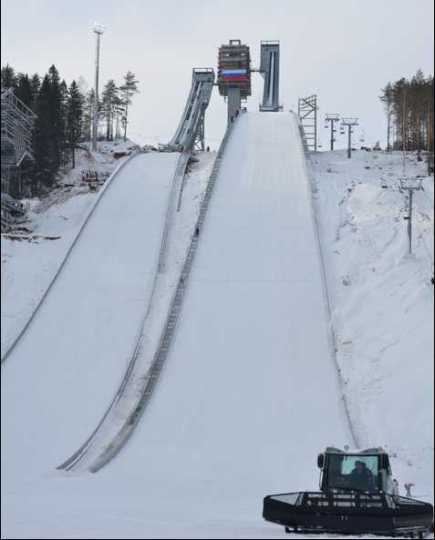 Sie konnen aus Perm oder Ihzevsk nach Chaikovskiy nur Bus benutzen. 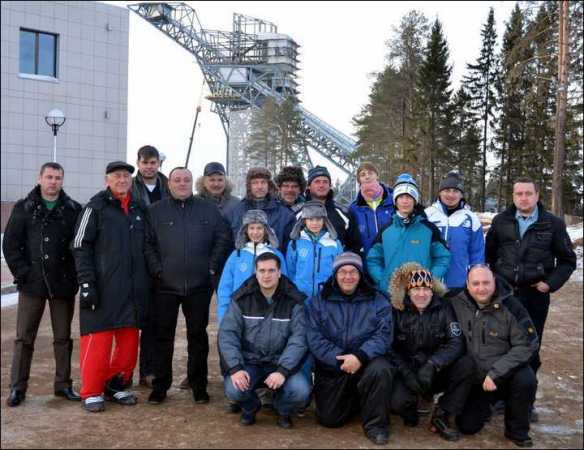 Fur Tailnehmer Seniorienmasterschaft wurde special Bus organisiert. 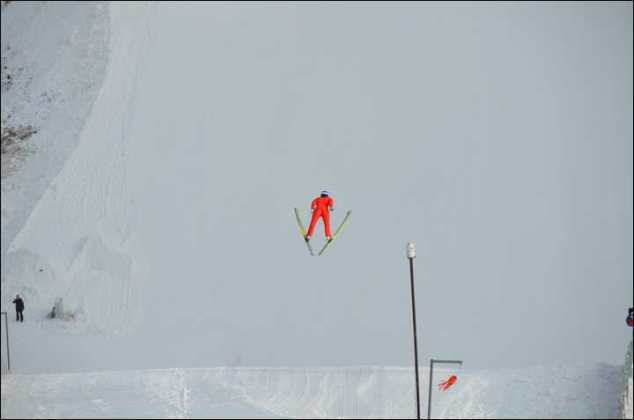 2 unserer Skispringer möchten im März 2013 an der Seniorenmeisterschaft teilnehmen. 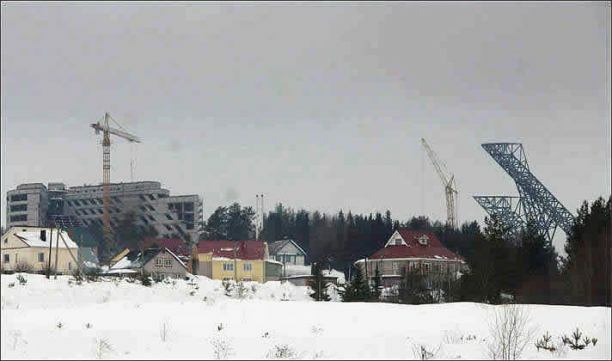 Bitte teilen Sie uns schnellstmöglich die besten Bus- / Zugverbindungen von Perm nach Chaykovskiy mit. 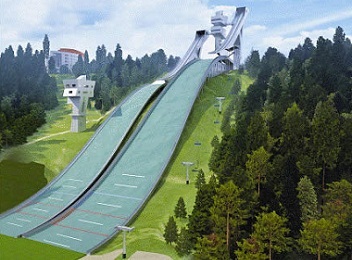 Falls vorhanden, bzw angeboten auch komplette Pakete Anreise und Unterkunft.